Love is a many splendored thing, and wordsmiths through the ages have tried to tie it down and tell us what it’s like. Many times they miss the mark or only get it partially right. 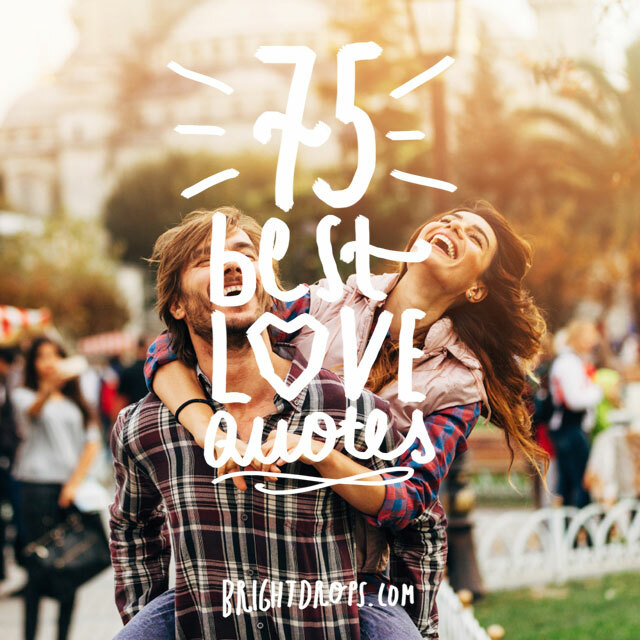 Here are some of the most beautiful love quotes that do a good job of capturing the essence and the grandness of what love really means. From the biggest to the smallest creature there is a desire to love. It’s interesting to think that each living thing out there is looking for love at its core. 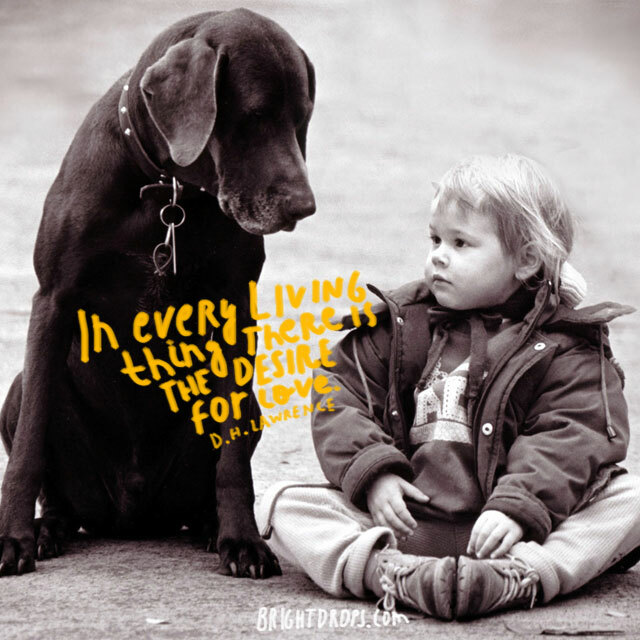 This must be why we resonate with pets and with nature because it puts us in touch with things that are just as alive as we are. 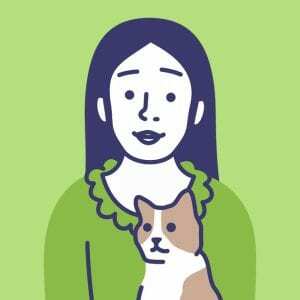 We can feel a good energy from our dogs and cats and we can talk a walk through the woods and feel that desire for love emanating from the plants and the wild animals making their home in the brush. It’s all very exhilarating to think about, and is a feeling we can capture every day. 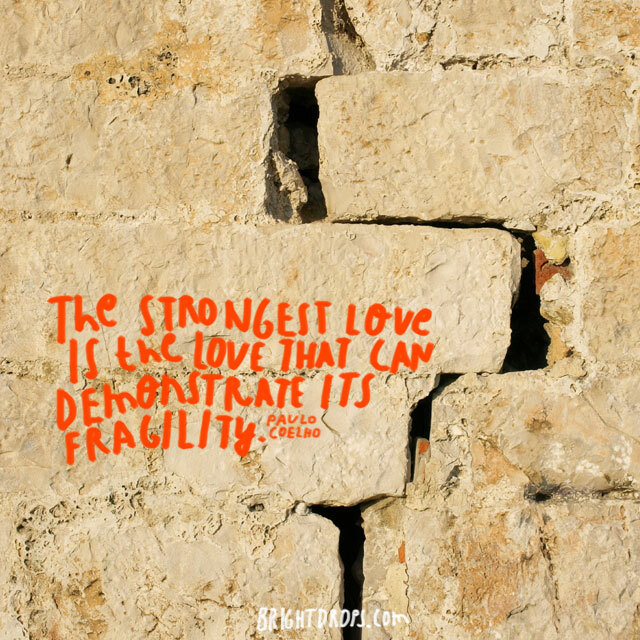 So often love is thought of as either strong or weak, but this quote reminds us that love can be fragile while still remaining strong. It sounds illogical or counterintuitive to think of something being fragile and strong at the same time, as most things aren’t. But love is a special kind of energy that is able to both at once. You don’t have to question whether your love is strong just because it seems like it may break from time to time. This is not proof that it is weak, but rather the opposite. There really isn’t much more to say when you wrap it up so neatly. All a person really needs is love, and that’s all they need. It’s simple and a little repetitive, but it’s powerful all the same and it’s one of the most feel good quotes on love that’s out there. Because this quote is set to music in a song it’s easy to sing along with and have a positive energy in your heart. It’s just as true now as when it was first written, and it will likely stand the test of time as each new generation sees the truth that lies in it. 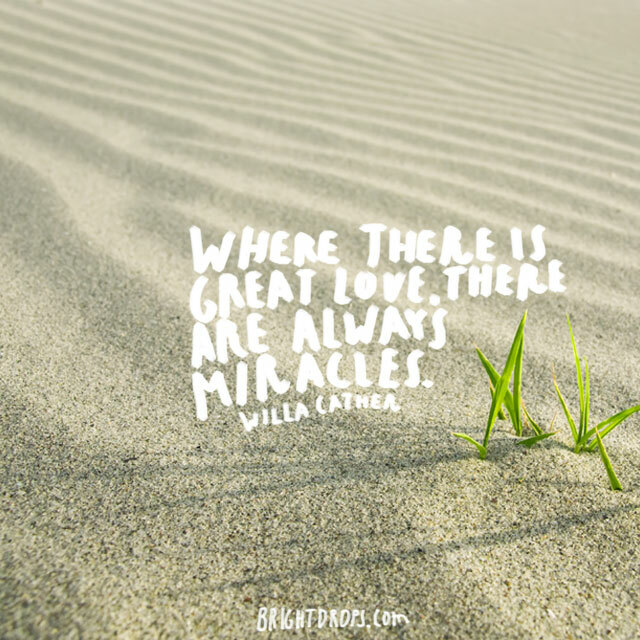 How fun to think that love and miracles are connected, but the power of love is well documented, and it only makes sense that it would be able to spur on great things that would otherwise seem impossible. Albert Einstein’s quote about viewing life as everything being a miracle goes along with this quote, and when you start recognizing the miracles all around us you can then start to discover the love that is behind each of them. You can also look to create miracles in your own life by ramping up the amount of love you’re feeling. 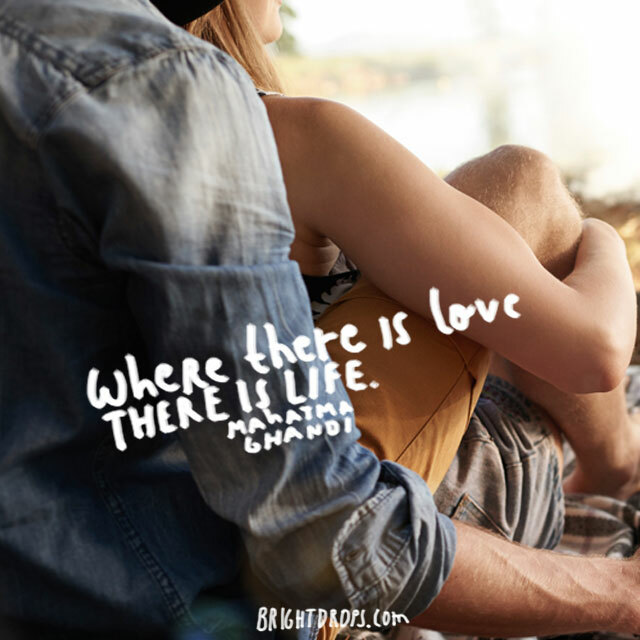 Love and life are intertwined and this quote puts it quite concisely that where you find love you’ll find life. Some may even say that love and life are one and the same, and that life is just an extension of love or vice versa. Love gives life its meaning, and without it there isn’t much life at all. It’s important to fill your life with love and to love what’s in your life if you want to get the most out of it. 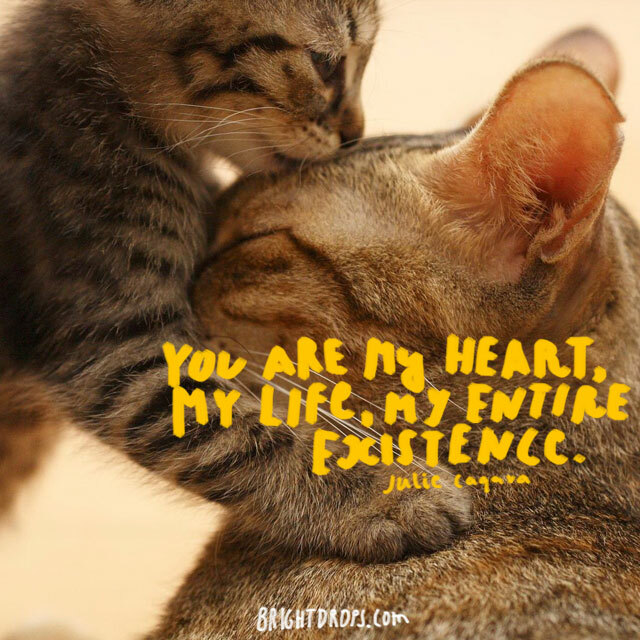 You can also look for love in all forms of life, which is why we love our pets so much and have a fascination with other animals and creatures, as they’re all expressions of life itself. What an interesting analogy. 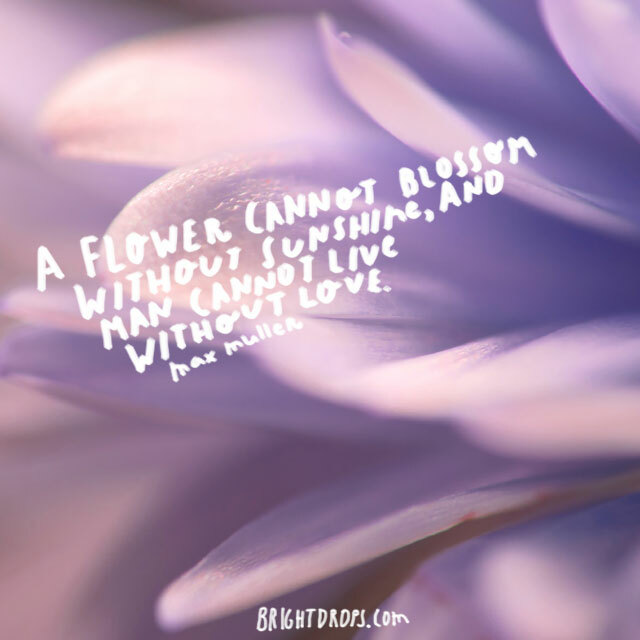 When you think of how important sunshine is to a flower’s survival, it becomes clear just how important love is for us humans. It helps us grow and develop and reach our full potential. It’s true that without the love of family, friends, and romantic love that we just can’t be the most we can be. Countless examples exist of those that are depressed and fail to be what they might have been due to a lack of love in their lives. It’s tragic, but shows that we all need to love and be loved to survive. It’s interesting to think that the things we love about another are probably qualities that we have ourselves, or that we wish we had. This doesn’t mean you’re being narcissistic when you love someone else, it’s just saying that we’re all one and we’re all in this together so when you see yourself in another and love that person you are contributing to the overall amount of love in existence. It’s also great to think that those that love you have found a bit of themselves in you. Instead of wondering how to drive a woman crazy with other methods, love works much more effectively and reliably. And it’s the good kind of crazy, the kind that makes her think of you and want to be with you all of the time. This is a cute quote that’s based on sound reasoning and has been time tested throughout the years. It’s also the one place that is often neglected or thought of as a back burner sort of priority. But it should really be the first place that gets the most attention. 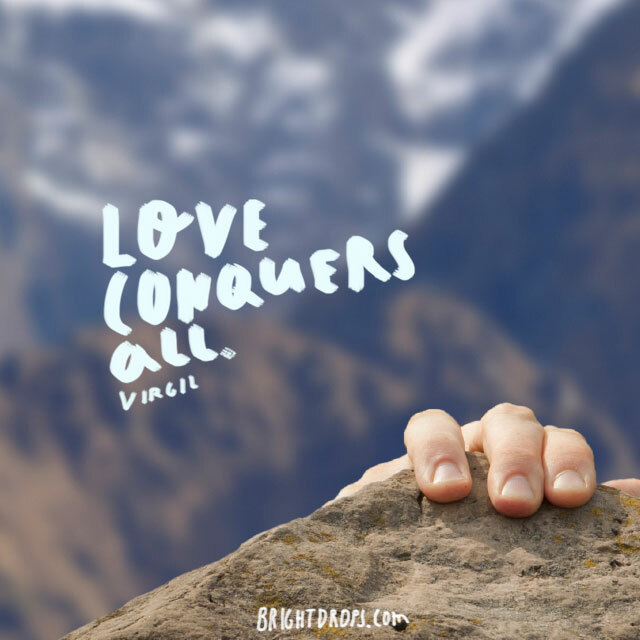 There isn’t anything that love can’t conquer, and it’s made quite clear in this quote. Three simple words and love is given its full credit as being the one force that can’t be overcome. At times when you feel like things are out of control and look hopeless, it likely means that there hasn’t been enough love applied to it. Try loving more, not less, and you’ll find that even the biggest problems and the most dreadful people can’t overtake the power of love and all that it can provide. 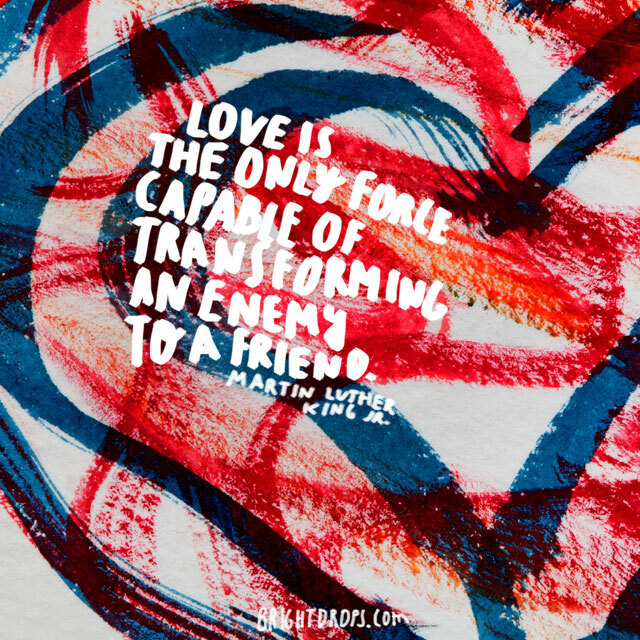 It’s refreshing to know that love is more powerful than hate, or anger, or any other negative emotion. Love is a very powerful thing, and those that can wield it hold a great advantage over those that don’t. This isn’t the sort of power that is often talked about, like being the president of a country, or the CEO of a major corporation. It’s a different sort of power, one that anyone can have, and we can all be the most powerful person in the world. When you’re bursting with love things are bound to go your way, that’s just how amazing it is. Love doesn’t have to be rainbows and butterflies all of the time, and this is saying that love is what gets you through the tough times with someone, and the fact that you’ve been through those times is proof enough of the love you share. It seems that many times love is broken or tossed aside when things get tough, but not when it’s real love. Real love is what gets you through those tough times and brings you closer to the person that you love. Love is an art form and loving another person can take on a different look from one person to another. You may have love for plenty of people in your life, but each one will be different, a different work of art so to speak. How you express your love is like making a painting, and you can use different colors and different styles for each one. Think of each as a masterpiece that is being painted one stroke at a time, one day at a time. Here’s a way to say that true love never dies. 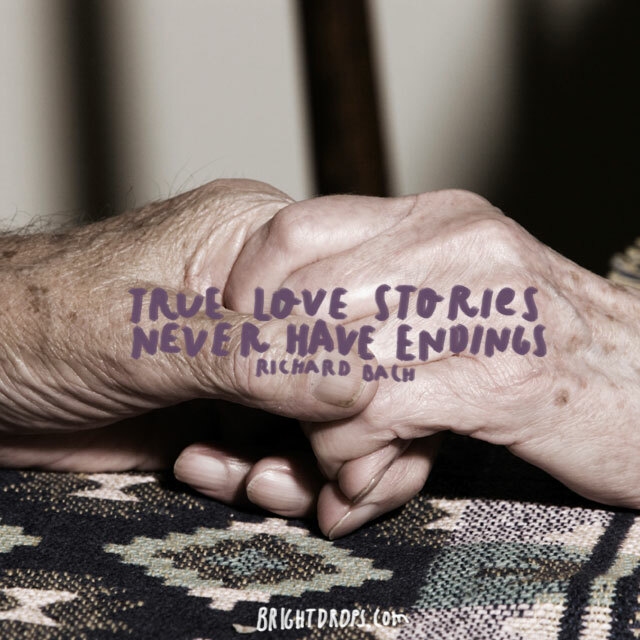 Rather than a happy ending or a sad ending, when it’s true love there’s never an ending at all. It endures all things and lasts forever. When you think of love as an energy, and then remember that energy cannot be created or destroyed, you’re really tapping into an endless source. That’s how love can carry on through the ages, even past our physical lifetimes and into the hereafter. It’s the sort of thing that they write fairy tales about, but it’s real and can be had by anyone that chooses to open themselves up to true love. It’s interesting to think that love is such a powerful and huge force that the only ones that can fully appreciate it are those that don’t overthink it. What Johnny is saying here is that a full grown adult will have too much baggage and misconceptions about what love is, that they won’t be able to wrap their head around pure love. But it is possible to see pure love in action, because dogs and infants are able to express it completely. 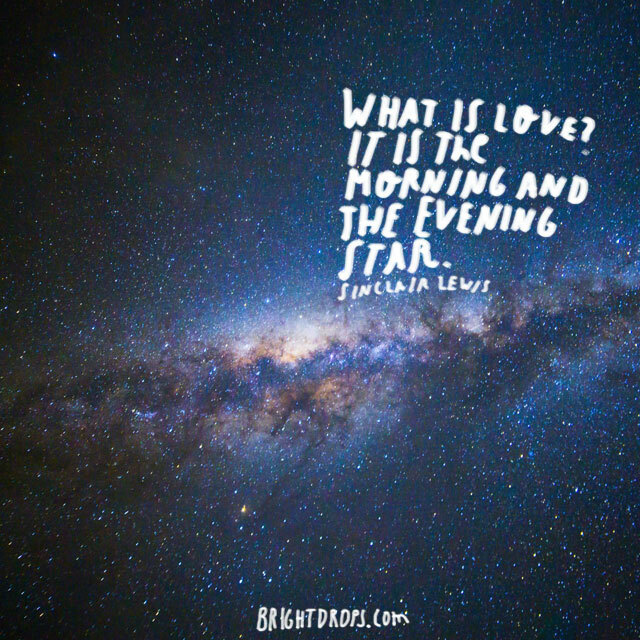 What a beautiful quote on love, one that shows how love can be and should be. 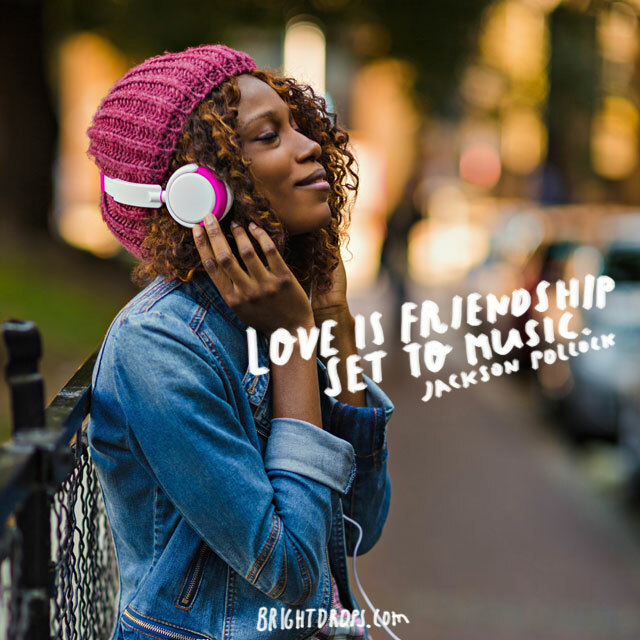 Friendships are amazing on their own, but when you picture all of the great things that come with a friendship, and then set that to music, you get a clearer picture of what love is. 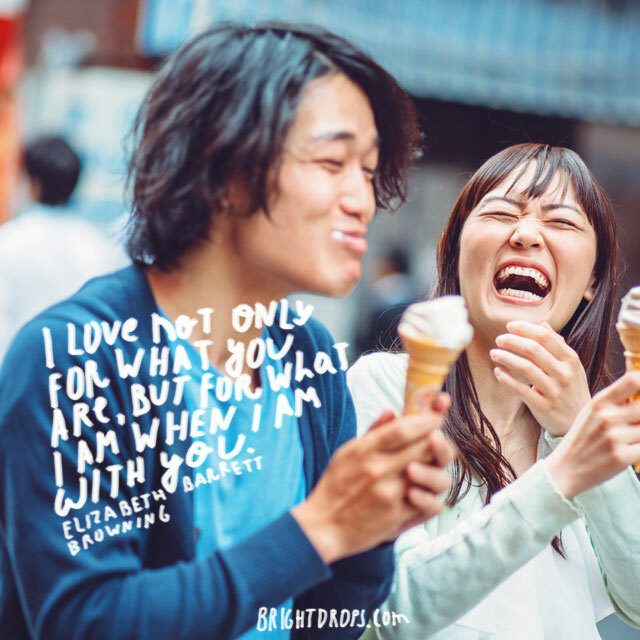 There isn’t anything better than being in love with your best friend, and it’s important to maintain that friendship feeling, with someone you love to spend time with, that you can confide in, that you can count on when things get tough, and that knows all of your flaws and loves you anyway. We all want to be happy, and our own happiness is paramount, but when you find yourself wishing happiness on another, even more so than yourself, you discover that you really love them. It may be startling when you first realize that you essentially care more about someone else than you do yourself, because it goes against our innate instincts of self preservation, but this is the cornerstone of love. It happens between parents and children, husband and wife, as well as anyone that rises up to that level of importance in your life. Here’s an amazing sentiment that gets down to the base of what feeling love for others really means. 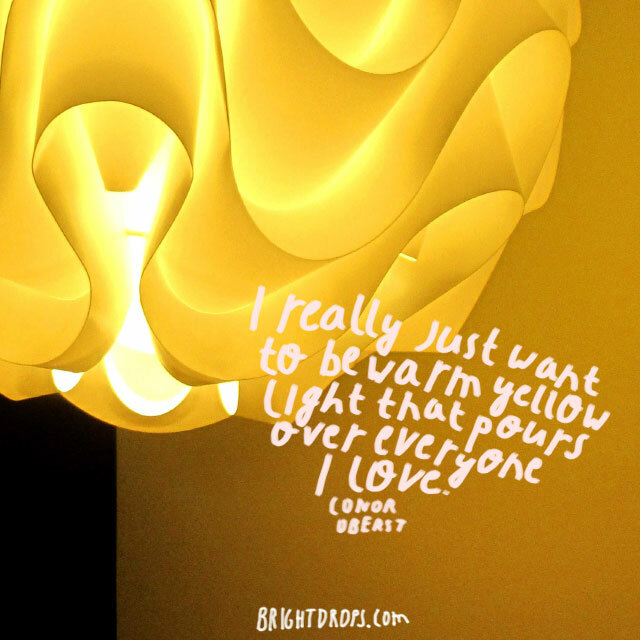 It’s like a nice warm glow that you can shine on everyone you really care about. You can also let it shine on people you don’t even know. It doesn’t have to be an actual physical thing, you can just radiate good vibrations to them and see how they respond. Not everyone will accept your loving vibes, but that’s on them. It matters not who responds, just that you hold that feeling in your own heart. It’s true that the perfect lover isn’t out there, it’s about creating the perfect love with the person that you care about most. The notion that someone is out there that is perfect for you is based on a false premise. 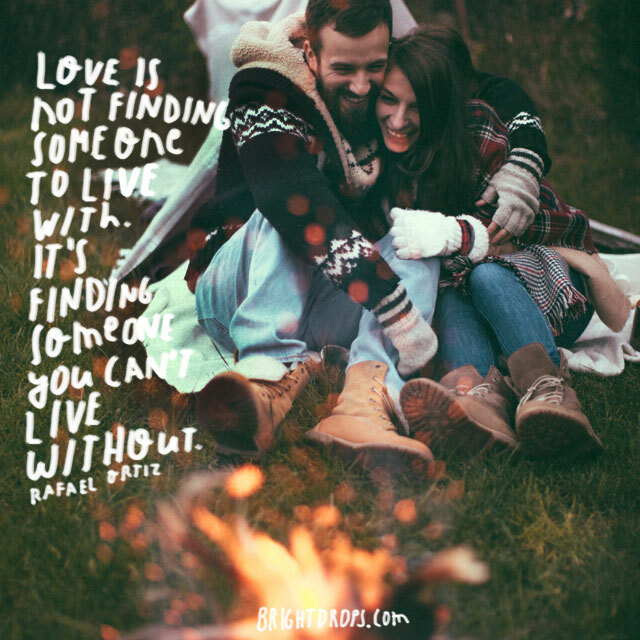 You are the creator of your world, so you don’t need to seek them out and find them like the dating sites say you do, you are creating things in your own reality, and that is true about the love of your life just as much as anything else. 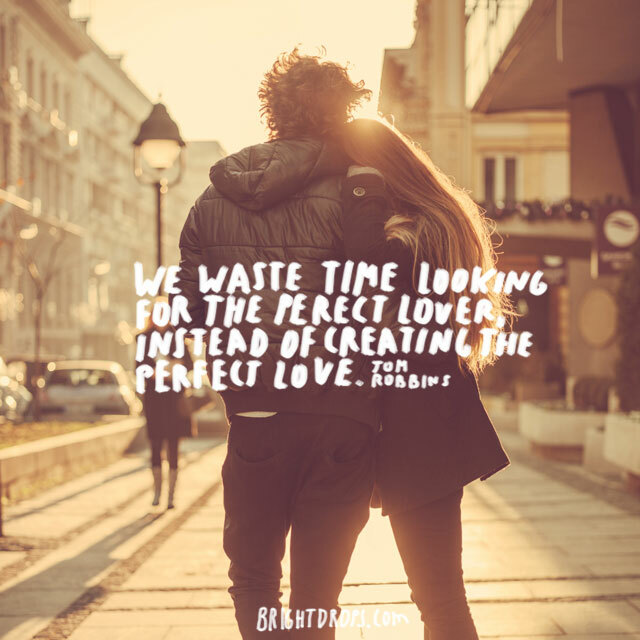 So get busy today creating the perfect love in your life. 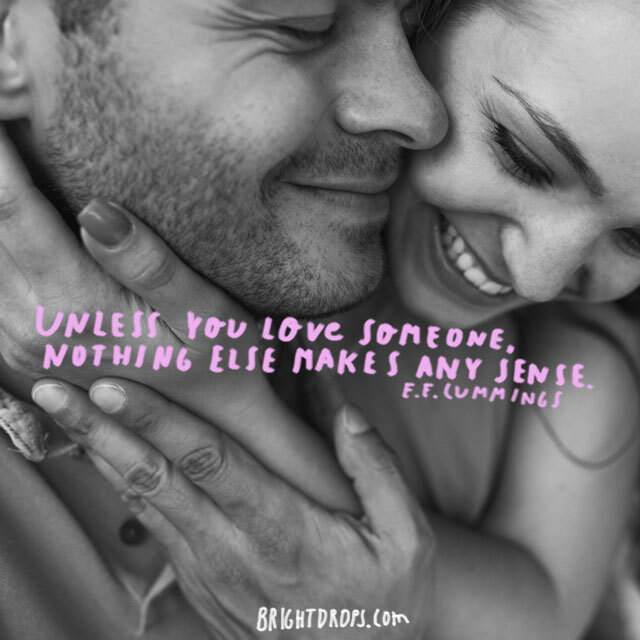 This is a fun quote about love that has a bit of a warning to it, but not in any sort of negative way. 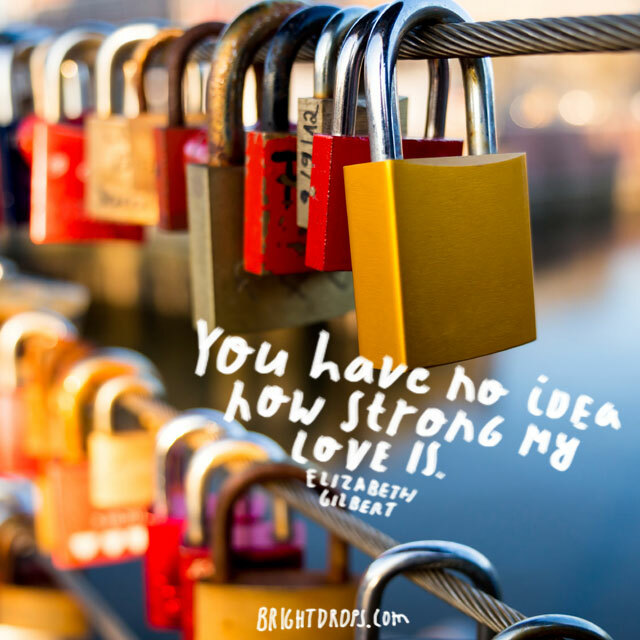 It’s all about letting someone know that your love is so strong that it can take on anything, and if you fully release it it can be an overwhelming experience. 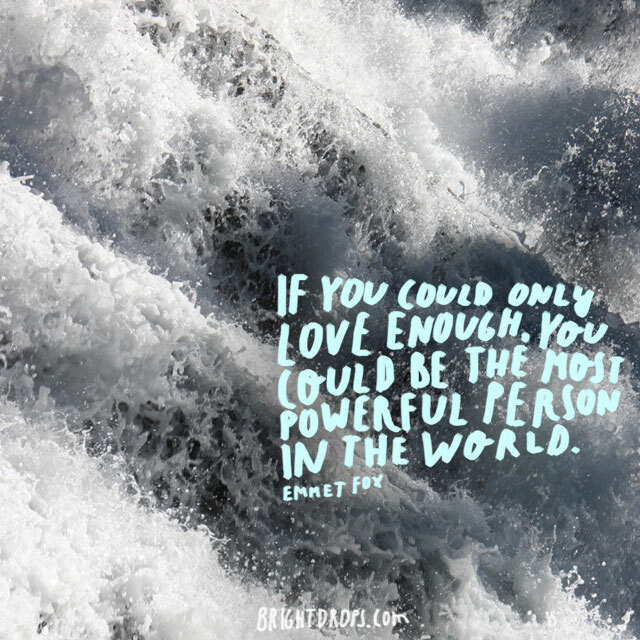 Have you ever felt the power of your own ability to love and been a little scared by it? There’s no need to be scared, because it’s only a positive force, and there’s no limit to how much you can love. When love happens to you it feels like it couldn’t have gone any other way. Many times it drops out of nowhere and hits you unexpectedly. 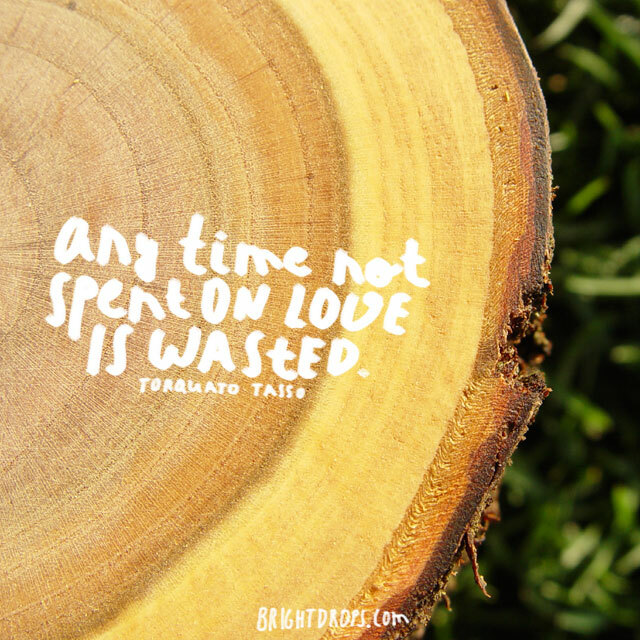 Although this quote is quite nice, there are also those loves that creep up on you, and develop over time. But more to the point, it’s saying that you can’t logically think of love, because it defies logic and it can even defy your rational thinking. You may not be looking for love, or even wanting it, but it will find you when you least expect it. 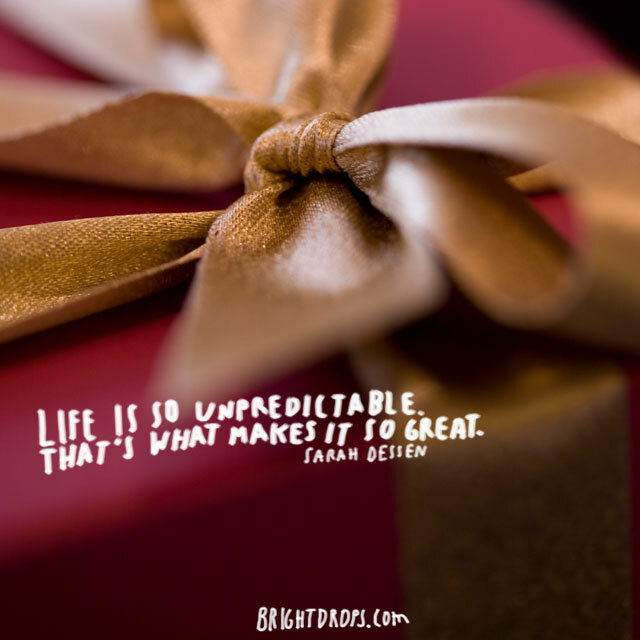 It’s the unpredictability of love that makes it so exciting, and makes it so everyone loves it when it happens to them. Life has its trials and tribulations, its long days, its hard days, but one thing you can always count on is love to refresh and rejuvenate you so that life is fun and worth living. 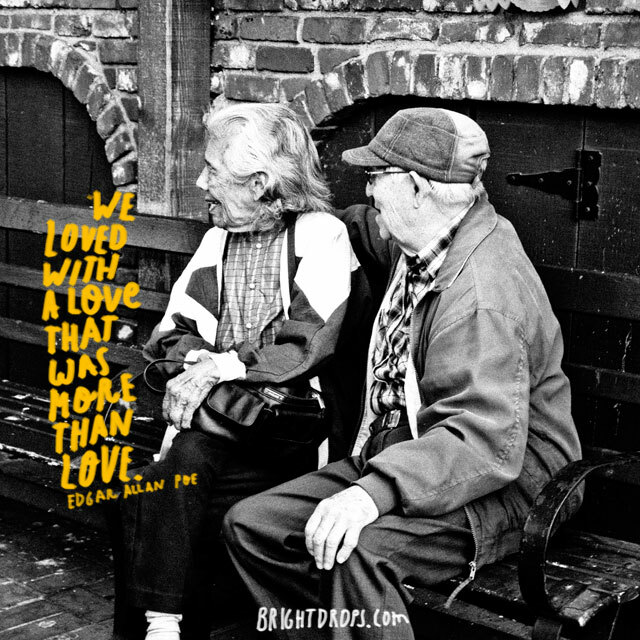 Without love as a refreshment we’d have a rough go of things day in and day out. 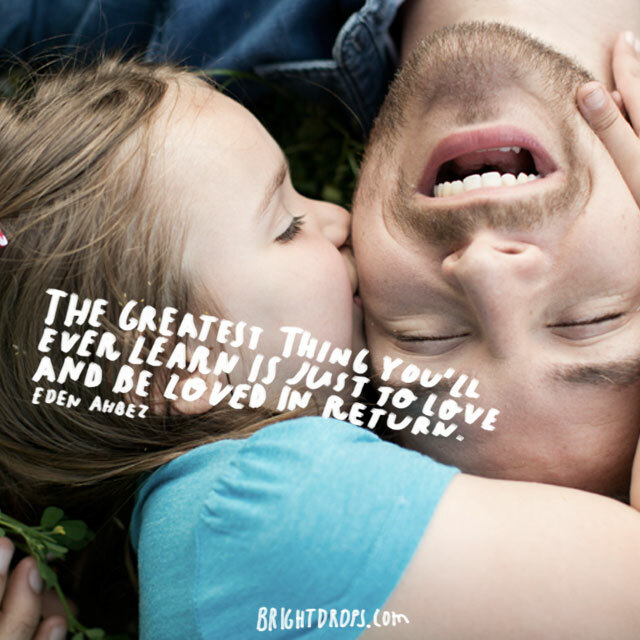 And while there are other things in life that can refresh us, this quote is saying that love is the greatest of them all. Without it, all of the other refreshing things in life wouldn’t really do the job. 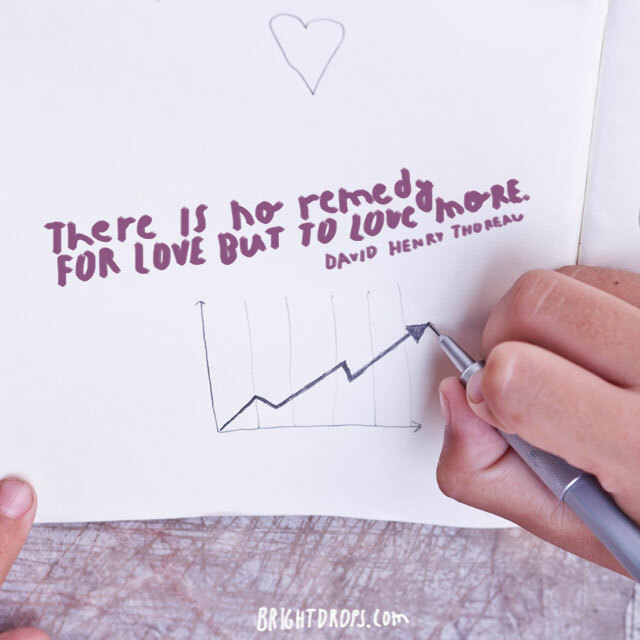 How can you use love to feel refreshed today? The world can be a real senseless place, but knowing that you love someone makes it more manageable. It provides you with one thing that does make sense, so you can cope with the other things in life that are pretty inane. When you think about that person it should give you a feeling of calm and ease, knowing that everything is alright. And you aren’t limited to that one person, you can use the love you have for everyone in your life to help make sense of the world. This is truly one of the greatest things you can learn, and it’s not as easy as it seems at first. It may be easy enough to love someone, but to allow them to love you is the tricky part. Or maybe you’re able to be loved, but you have trouble loving in return. It’s a skill that must be mastered in order to enjoy life to the fullest, and is something that many are still learning to acquire. If you feel that you are not receiving enough enough love, perhaps it’s because you are not accepting that love. You’ve just go to keep loving more and more if you’ve been hurt by love. Love can sometimes hurt, but there’s only one solution and that’s to keep loving, not to stop loving. If your answer to being hurt by love was to stop loving, it only makes things worse and keeps you from amazing experiences. Love is a powerful force, and anything that powerful can also cause pain, but there’s only one way to get past that and that’s to love even more. 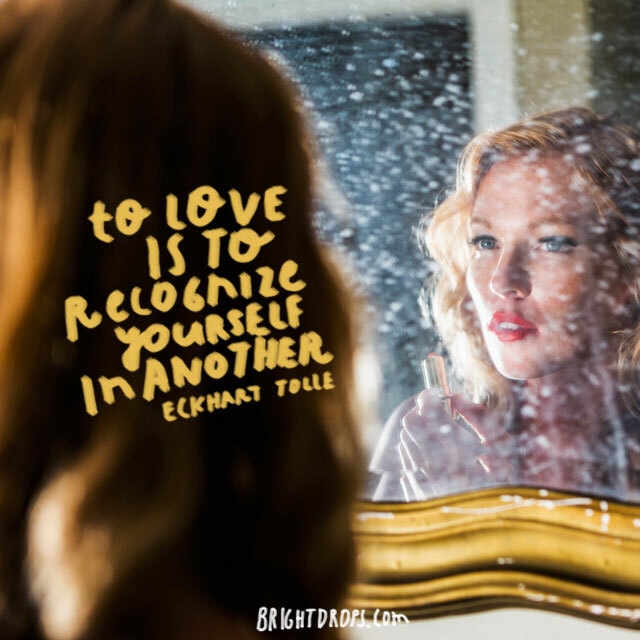 Love yourself, love your family, and don’t be afraid to fall in love again. 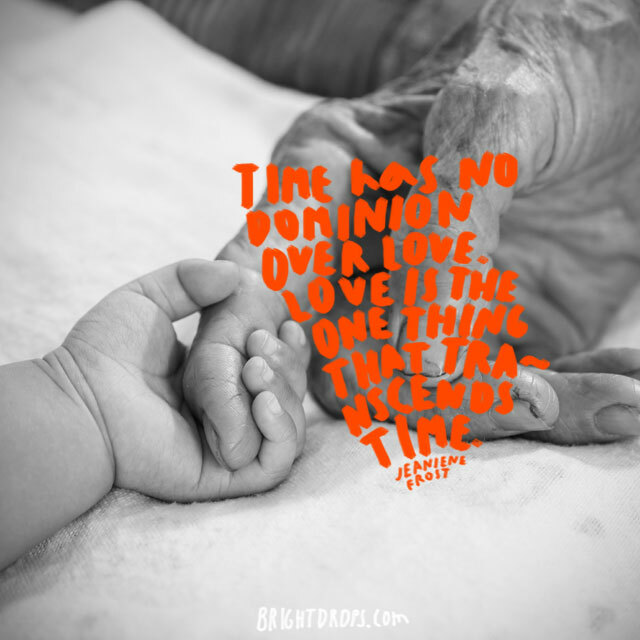 Time as we are familiar with it is just a creation that we use, and love has no connection to it. Love keeps right on going regardless of time, because it’s not confined to our physical presence and subjected to the same laws that we are. It’s almost silly to think of love and time simultaneously because one has nothing to do with the other. “Timeless love” is a redundant phrase because love is timeless at its core. Have you ever felt that you and the person you love were separated into two bodies? 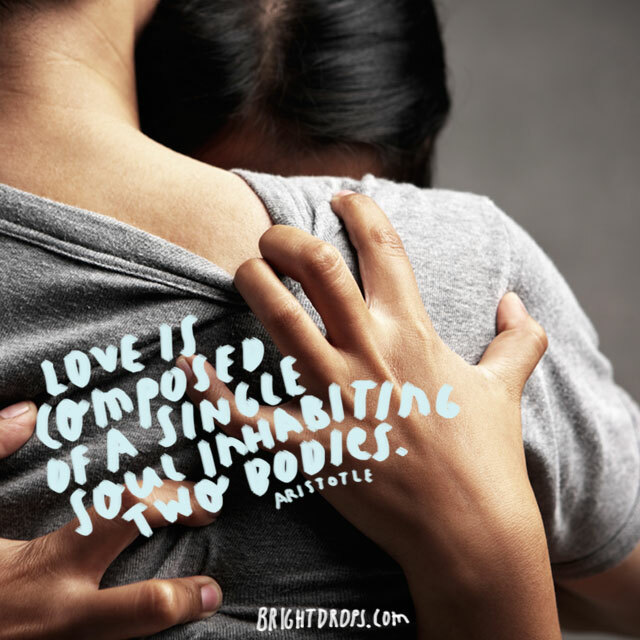 That’s the feeling of love and the basis of the concept of a soulmate. It’s as if you two are connected so deeply that part of you is in their body and part of them is in your body. It can be a strange feeling at first, but once you embrace it it can be wonderful. This doesn’t mean that you are half a person, or that you are half a soul, but rather that one fully developed soul has been split into two bodies. It’s been said that there isn’t any meaning to things unless you give it meaning, and love is the emotion or the energy behind it all. Think about the things in your life that you love. That’s a pretty intense emotion to apply to an inanimate object, but it’s perfectly okay to love the things in your life and to give them worth and meaning through that love. Just be sure not to get too attached to them, because at the end of the day they’re just things. 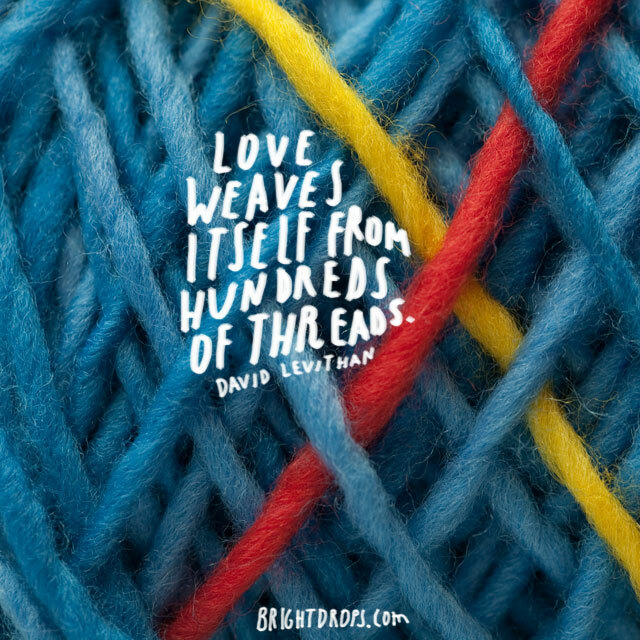 It’s amazing to think of love as being woven, and using hundreds of threads. It’s a way to show its complexity, and shows that it’s not just something that happens all at once. It is also pointing out the autonomy of love, saying that it weaves itself, so that you don’t need to be a part of the process, it’s always flowing, always perpetuating itself. One thing is interesting and that’s what the threads are that are weaving love. Are these threads shared experiences or different people, or a string of emotions? The vagueness of what these threads are makes this quote extra enticing because it is up to your own interpretation and experience with love. 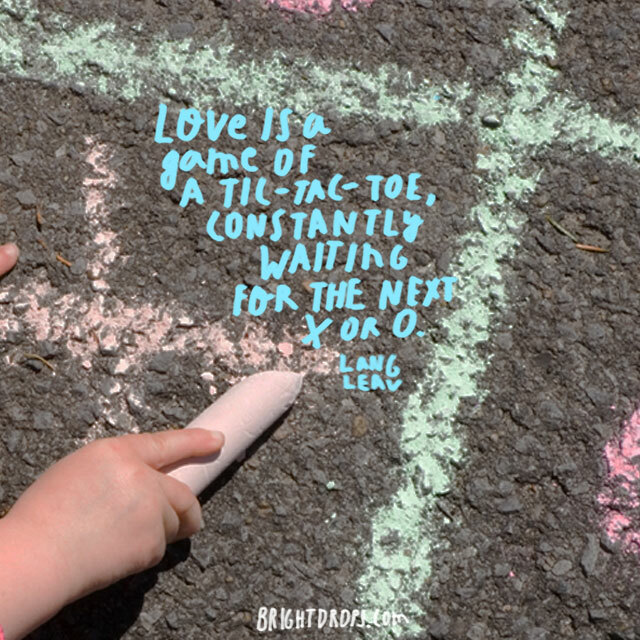 Here’s a cute saying about love that plays on the classic tic-tac-toe game and references the use of x’s and o’s as in kisses and hugs. 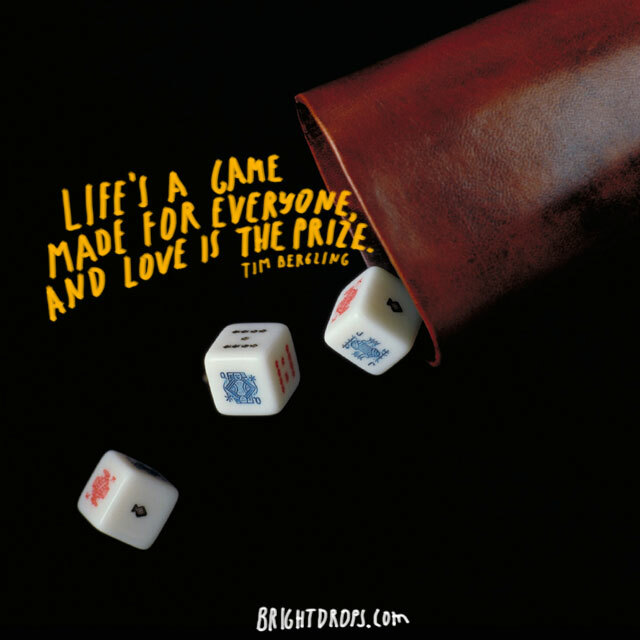 In the game you’re trying to get three in a row, and each player takes a turn giving an x or an o, so it paints the picture of exchanging hugs and kisses back and forth with your love. It also encourages playfulness with love, as well as keeping that physical connection. 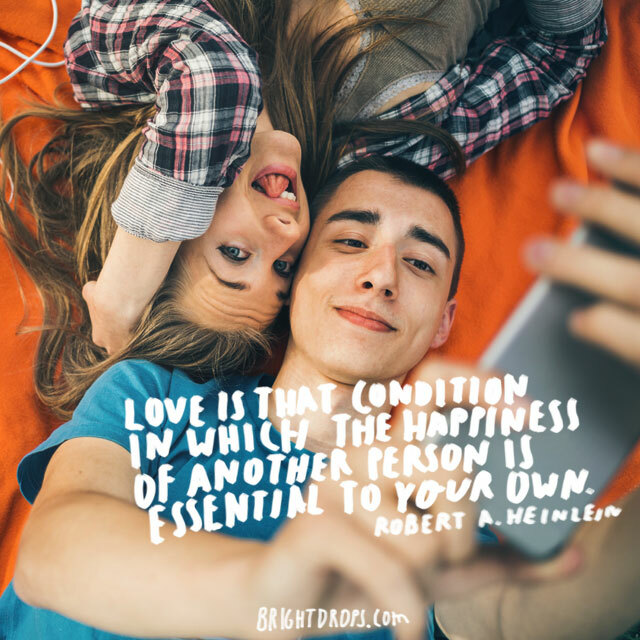 Often with those we love it can be hard to keep the physical affection going, especially with busy lives. but it’s important to make sure they feel wanted and loved in all areas of life. This is motivation to go out there and love deeply, because you’ll be loved deeply in return and you’ll be stronger and more courageous as a result. It takes strength to be courageous, and courage to be strong, so all of this is interconnected. The opposite is also true, if you’re not getting enough love you might not feel as strong, and if you’re not giving enough love you might not feel as courageous. Make an effort to love deeply and you’ll find that this gets reciprocated and strength comes as a result. 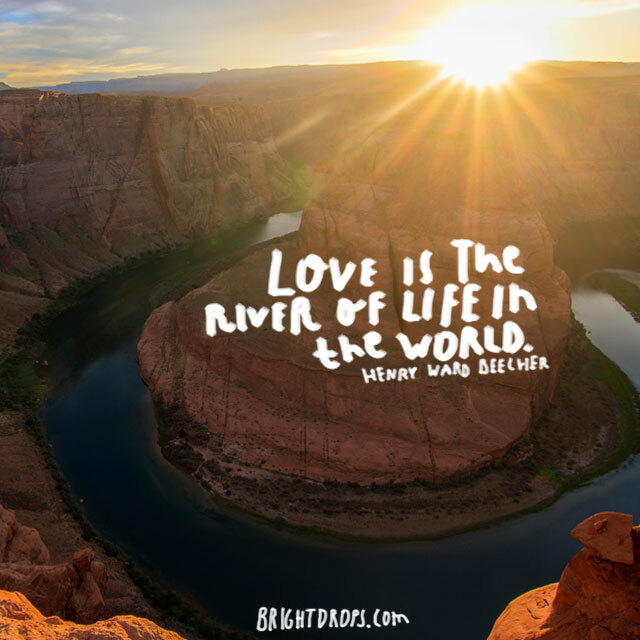 It’s nice to think of love as a river, and even more great to think of it as the river of life. Love is what makes the world go round and produces new life. When you think that we don’t really know when life on Earth began or how it’s clear that there was some force that started it off. These days it’s love that breathes life into things, and it’s amazing to think that we’re all a part of it and that it’s flowing strongly. It permeates all parts of the world and life forms can be found pretty much everywhere, even in the most remote places, because love is there too. Love and nature go hand in hand and here’s a quote that shows that love is what fills up life with sweetness. A flower is just a flower, but when it is used to make honey it is put to the best use possible. 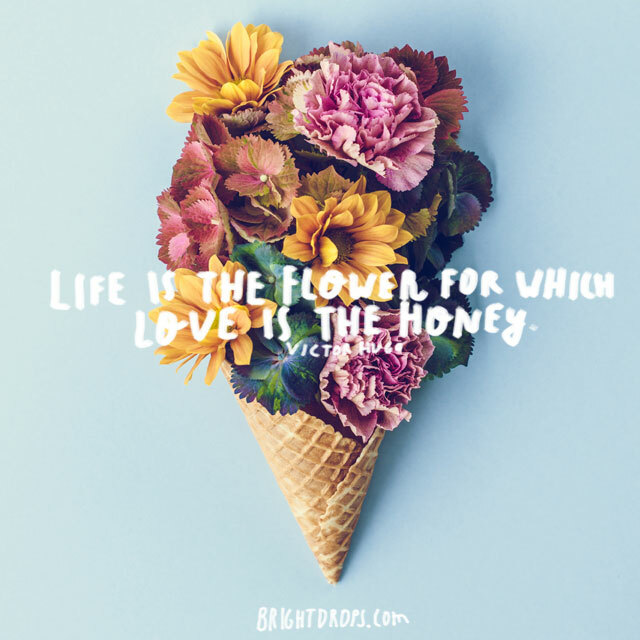 What’s unclear from this quote is what the bees that produce the honey are analogous to. Perhaps it is us humans that are the bees, and we are making love out of the life that we are given. When you’re in love this is what it feels like, that someone is your heart, the thing that makes you move, as well as your life and your existence, the larger part of who you are. 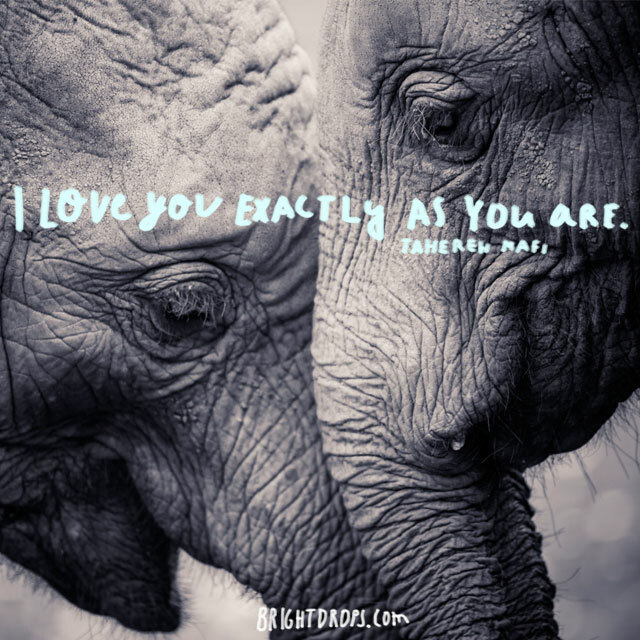 It can be a bit daunting to realize that someone has become this big a part of you, but you can relax into the warm feelings that arise when you realize that it is perfectly okay to love someone this much and in all likelihood they are feeling the same way about you. This seems pretty extreme at first but when you think about it it is the only way to go. You should be doing what you love, and thinking about the people that you love all the time under ideal circumstances. If you are not in love with what you are doing, you should try to find something that you enjoy doing and even love so that it doesn’t feel like work. And if you are not spending time on something you love you can at least keep your mind on the things that you do love in order to make unpleasant tasks more pleasant. This is a beautiful quote because it wraps up all of the good feelings of falling in love, and having the other person acknowledge those feelings and smile with gracious acceptance. Leave it to Shakespeare to come up with a concise way to sum up what it feels like to be in love, and being able to convey what that experience is like in simple terms. He was quite the wordsmith to have the ability to write into words feelings that are so big and universal, but usually remain ineffable. Love is infinite because it is a positive energy, and you can get a glimpse of that when you look into the eyes of someone that is in love, or that loves you. Have you ever locked gazes with the love in your life and seen that the love they have for you goes on and on? If not you should try it out today and you’ll be blown away. The eyes really are windows into the soul and if that soul is emitting positive love it will be apparent in their eyes. You’ll also be transmitting this into theirs and they’ll be blown away by the power of this love. This quote is a reminder to put most of your effort into giving love, rather than worrying about how much love you receive. It seems that in order to keep love you need to give it away, and that trying to hoard love is a losing proposition. If you are trying to hoard it it means that you are thinking about it the wrong way. Instead shift your focus to giving even more love so you can keep even more love. So many times a person that loves us also wants us to change, so it’s nice to hear a quote that lets us be who we are and be loved anyway. Real love shouldn’t involve asking someone to change, it is all about loving someone even though they might not be perfect. Looking for perfection is futile and it makes more sense to love someone for who they really are rather than loving them and then asking them to change to meet your specific requirements. That warm feeling you get from those that love you, and when you are feeling love towards them, that’s the feeling of love, and it really is as warming as the sun. It’s like feeling the sun all over and all at once, so this is a perfect way to describe what it’s like to have love in your life. It’s so great realize that love comes at you from all sides, it isn’t just something that you give out and don’t get back. You are constantly in the process of giving and receiving, even though you might not be receiving love from the same people you’re giving it to. 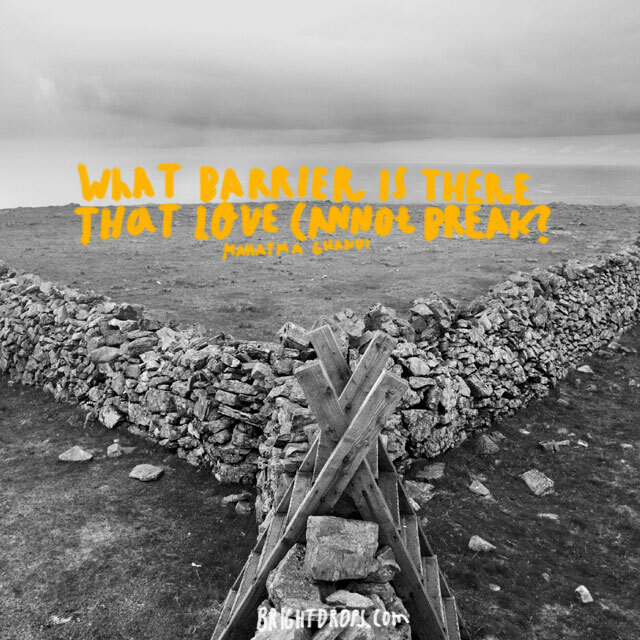 Love can break through all barriers, as is evidenced during times of tragedy when everyone bands together regardless of race or creed. It’s at the most trying of times that we all band together, and it’s love that is the reason. It’s a shame that love is not used during times of peace and calm to help bridge the divides that have formed through years of ignorance. 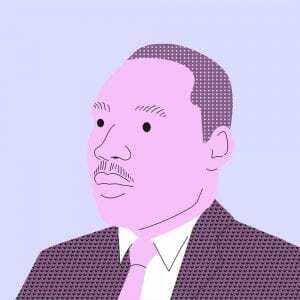 Our world is so interconnected now that it’s possible to show love in a variety of ways, and perhaps we’re finally making steps to love each citizen of the world regardless of any perceived barrier. It’s very apt to view love as a prize, because that’s how it feels when you have it. But at the same time it shouldn’t be viewed that only a few can share in the prize, or that there aren’t enough prizes for everyone that’s playing. Life really is made for everyone, and we each can experience love if we’re willing to let it in. Love as a prize can be romantic love or it can be the love you feel for your family, or your pet. It’s that specific feeling that’s the reason we’re all here in the first place, and you don’t have to earn it or compete for it, you can feel it right now if you decide to. What a sweet way to say that home is where the love is. If you’ve ever felt homesick it’s likely because you were away from those that love you. It’s not the actual house you’re longing for, but the love that fills that house with warmth and coziness. Being out on your own and far from home can also mean that you’re far away from those that you care about most. This can create a lot of uneasy feelings often described as homesickness. 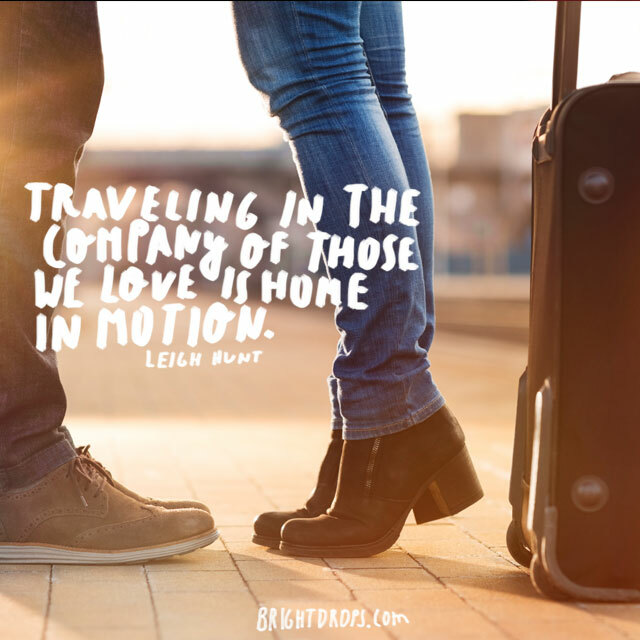 When you travel with those that you love it’s as if you can take the good feelings from home with you and it’s far superior than traveling solo. 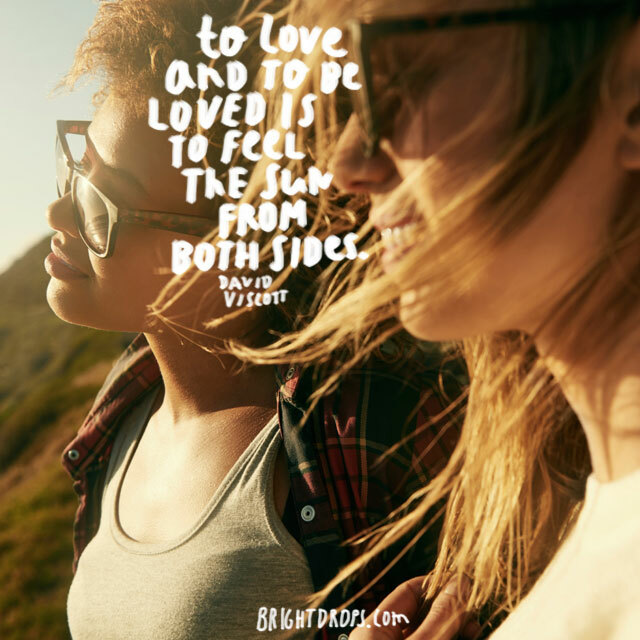 What a great way to describe love, and happiness and love are very close in the vibrations they provide. It’s hard to be happy without love, and it’s hard to love without being happy. 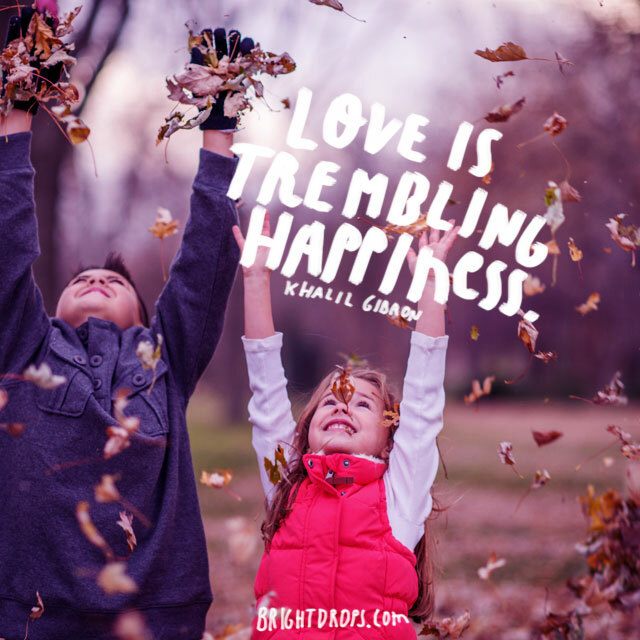 A trembling happiness is one that is so extreme that it leaves you with physical signs of being happy and excited. And love is a feeling that deserves to be described like this. It’s so hard to put a point on love that so many poets and authors and deep thinkers have tried, but it’s a feeling, and so far even the best descriptions leave out some aspect of love. 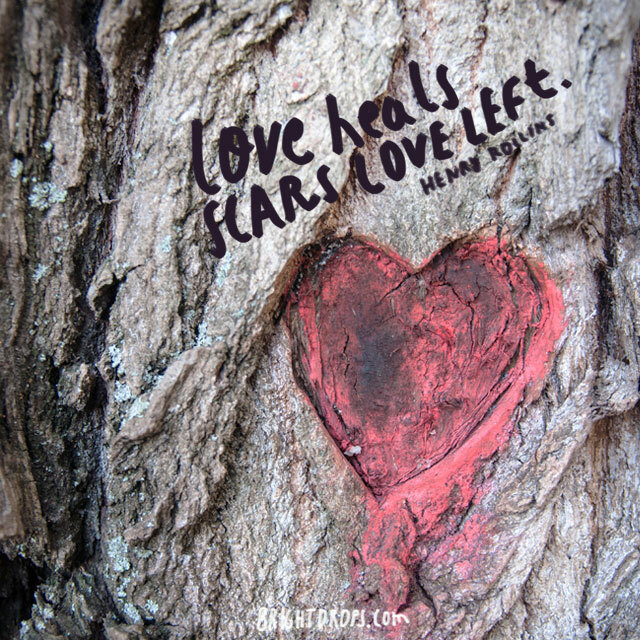 It’s true, love can leave scars, but it’s just as true that love can heal those scars as well. If you’ve been hurt by love, or are with someone that’s been hurt by love, you can heal your pain or theirs just by providing more love to them. It’s possible to realize that love is the answer, not the problem. If you’re showing the scars of love you can make them better by learning to love again, or learning to be loved again. It’s no use trying to avoid love or being afraid of getting more scars from it, as it is a healing force much more than it is a harmful one. Love is a combination of many things, and here she’s naming a few of the top ingredients. 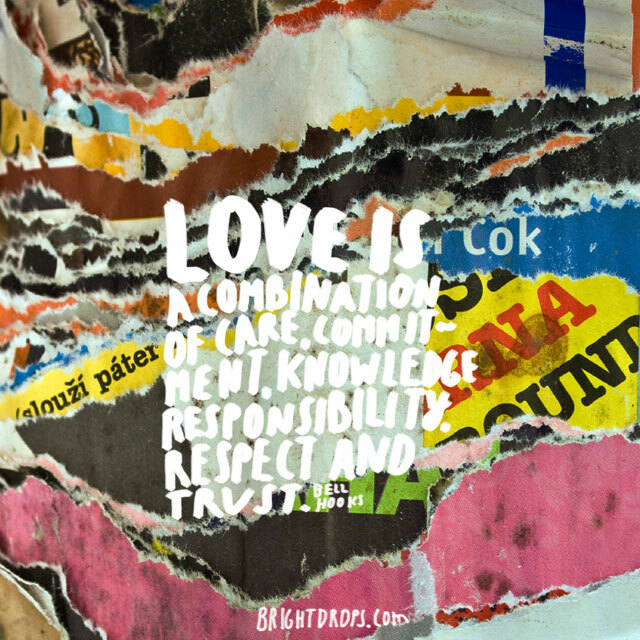 Perhaps it’s better to think that love encompasses all of these things, rather than it being a combination of them. Love encompasses all positive and beneficial things, and it’s true that caring, commitment, knowing, being responsible, respectful and trustful are all founded in love. Love is at the root of all of these, and at the root of all things positive in this world. Never give up on love, as there is always a chance to express your love and give your love. You can give it to a person or people, or you can let it flow into the work you do. You can also just feel love for yourself, so there really is always something to love. If you feel that you’ve run out of things to love, or the person you love isn’t in your life anymore, you can still love them, and you can also love new things around you. 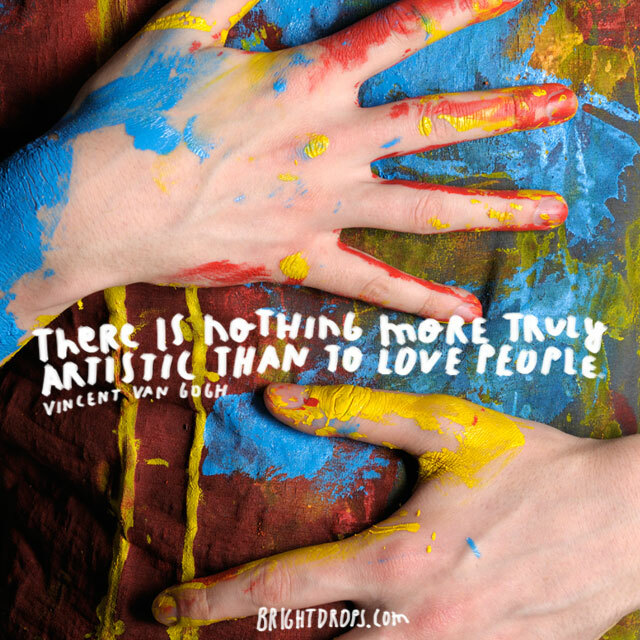 There’s no shortage of love, and the more you love the more you’re able to love, so get busy! If we’re afraid to love because we’re worried that it won’t be reciprocated, it can cause us to love only a little, or not at all. But that’s not an accurate way to view love, because you will be loved in return, but it might not be from the source you’re expecting. The universe doesn’t dabble in particulars, but if you start to love you’ll feel it come back to you, but it may come from some surprising sources. When it does line up that you’re being loved in return by the person you’re loving, it makes it something really special. Here’s the perfect way to show that love is what makes us fly. A bird with broken wings has lost its essence, and humans without the capacity to love have also lost their essence. A bird can still survive with broken wings, but not nearly as long as they could if they were able to fly. 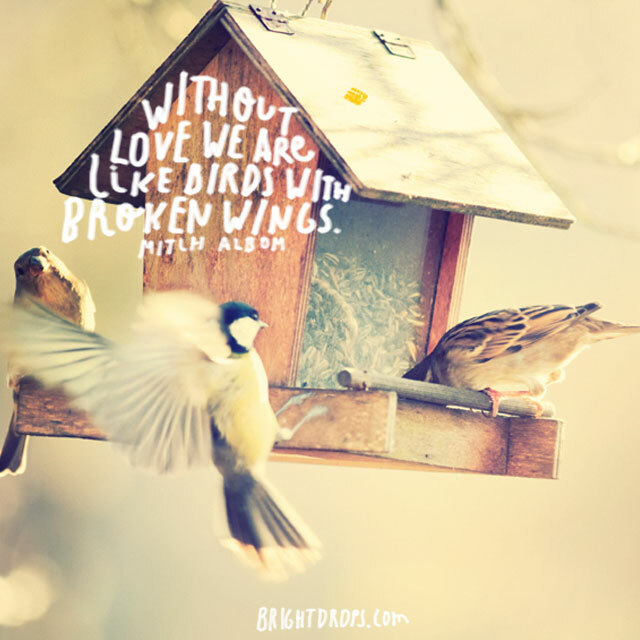 The soaring feeling you have when you are feeling love is akin to a bird in flight, and it only makes sense that if our emotional wings are broken we are unable to feel or express our love. Your heart is big enough to have someone set up shop in it, and letting them stay there rent free is a nice gesture. This is a beautiful quote because it shows that you are welcoming them into your heart and not expecting anything in return. It’s a clever way of saying that they can stay there indefinitely and make themselves comfortable because you are not thinking that they need to do anything in order to earn the right to stay there. This is the sort of hospitality we all should have when we are inviting another to take up residence in our hearts. 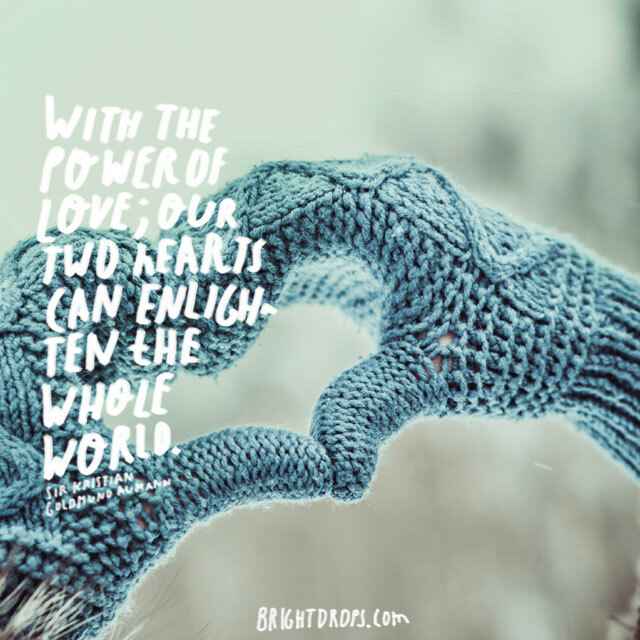 Another quote on the massive power of love. When you are sharing love with another it feels like you can light up the entire earth with it, that’s how amazing it is. That’s not just lip service but real emotions that are felt when the connection is strong enough between two people. One heart may be able to light up the world, but two hearts definitely can, as long as they are shining in unison. The effect is magnified by the power of two. A wonderful saying that wishes the best to those that you say it to. 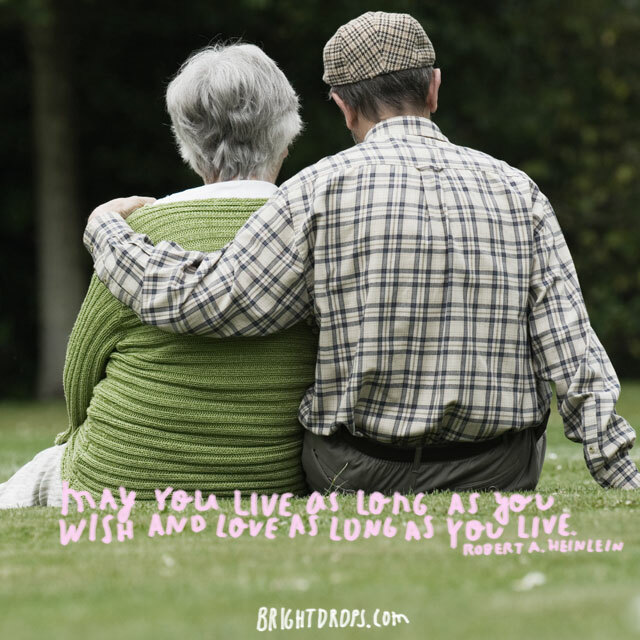 A long life filled with plenty of love is what we’re all wanting deep down. A long life with no love in it wouldn’t be much of a life at all, and if you have love in your life then a short life just won’t cut it. The best of both worlds is having a long happy life filled with people that love you, people that you love, and plenty of experiences that make it all worthwhile. Here’s a way of showing just how pervasive love is, you can love someone for their own qualities and also for the qualities that they bring out in you. That’s pretty impressive and something that can only be said about love. 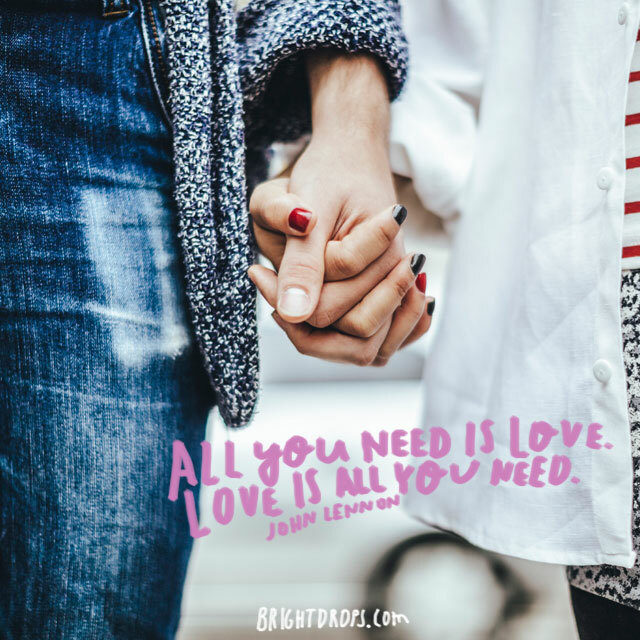 Scientists may boil down love to a series of chemical reactions and electrical impulses, but they aren’t able to explain what it is that love is, and how it makes us feel and how it brings out the best in each of us when it is present. 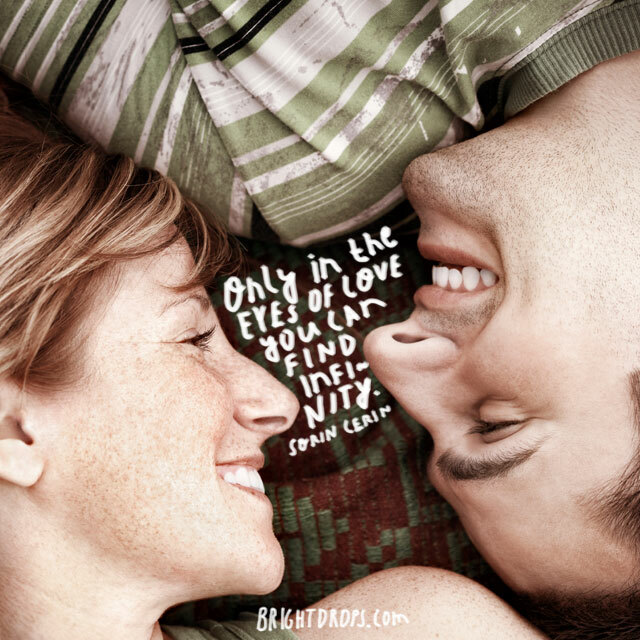 Here’s a lovely quote about love that shows it isn’t something that comes along every day. Love is brave, love is rare, love is beautiful, and it is something that many seek but have trouble finding. 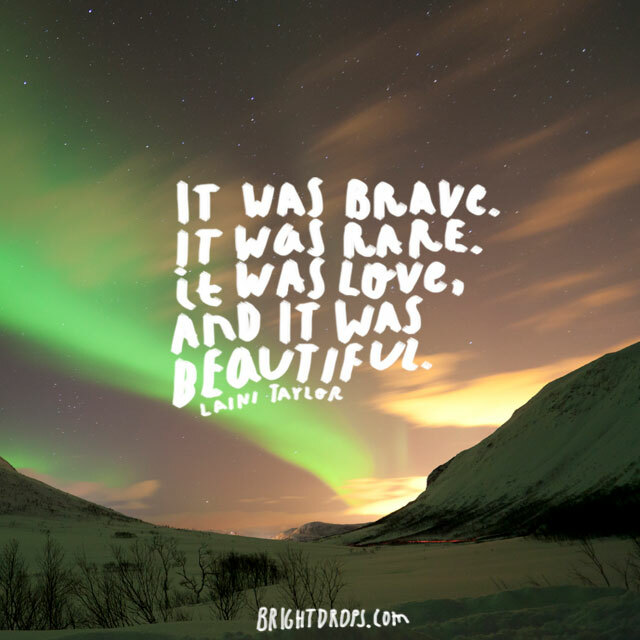 How can love be brave? It may mean that one must be brave in order to take on love because it has the power to leave you feeling bad if it goes away. How is love rare if it’s always available to everyone all of the time? Perhaps it’s referring to true love shared between two people in equal amounts. No matter what, it’s beautiful, as love always is. Are you brave enough for love? 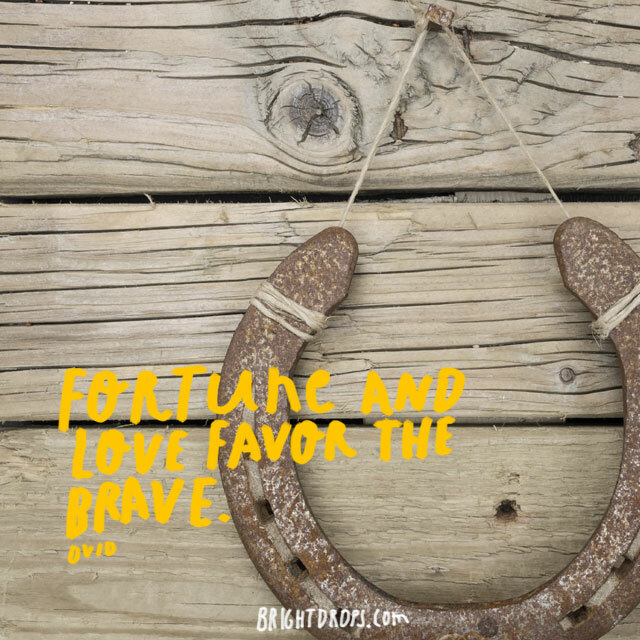 If you are brave you will surely be brave in love, and that’s almost a necessity when it comes to love because it can be hard goings sometimes. You have to be willing to fall flat on your face when you’re in love, and also to have your heart ripped out of you. If you are brave and can conquer your fears surrounding what it means to love and be loved you will be rewarded with the best kinds of love. 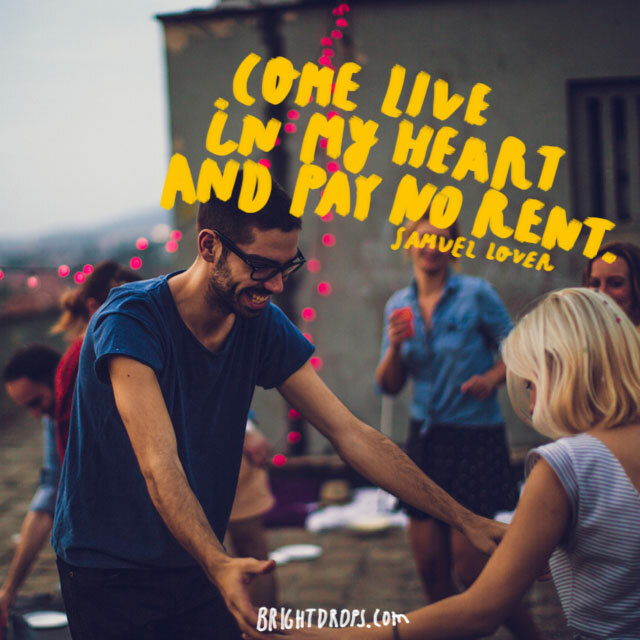 Live your life controlled by fear and love will not be able to enter your domain. As a bonus you also get fortune on your side too, so to the victor goes all the spoils. The feeling of not being able to live without someone is part of being in love. It’s the feeling that you couldn’t cope with life without them in it, and it’s a very strong feeling, and a moment of clarity when you realize this is the case. 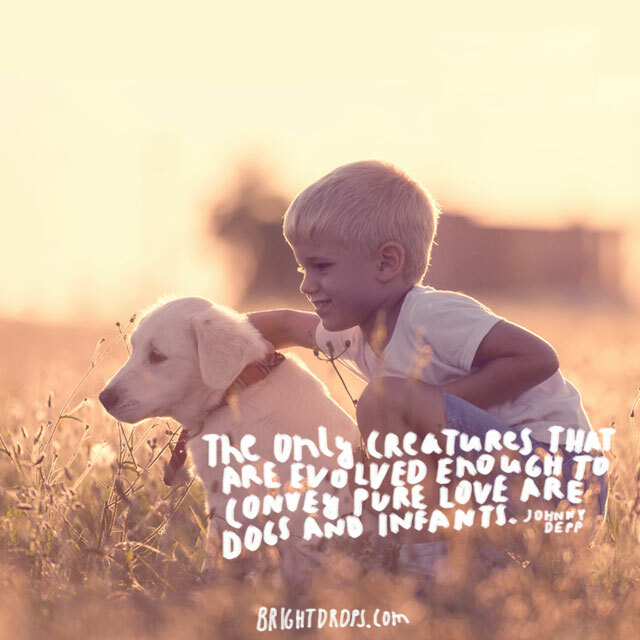 It usually doesn’t happen all at once, but is a product of loving them so deeply and allowing them to become a bigger and bigger part of your life that you just can’t imagine what life would be if they weren’t around. 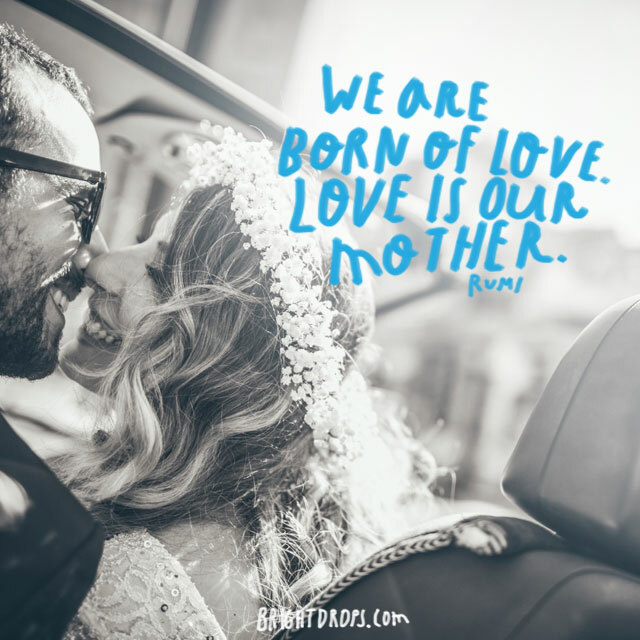 Love is what we are born from, the energy of love is what brings us into this world. 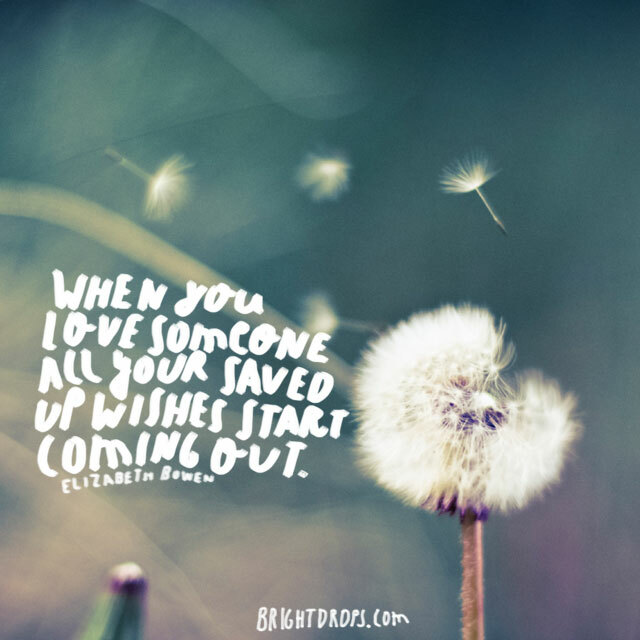 Our source is love itself, and that’s why it can be quite confusing to have issues or hang-ups when it comes to love. It’s as if we’ve forgotten where we’ve come from, and we need to get back to our roots. The feeling of love should not be alien to us, but for many it is an odd feeling that feels foreign thanks to years of twisted beliefs and bad experiences. When you undo all of the wrong thinking behind love and realize it’s your birthright you are getting back to a better place and becoming more in line with your larger self. Love is so much fun because you’re able to feel and be and do all of the things you’ve been wishing for with that special someone. It’s no surprise that these wishes have been saved up, because many times the right person to share those wishes with just isn’t around. When they finally do arrive you get to experience the thrill of a flood of wishes coming true, and they get to be the person you’ve always dreamed of. Just don’t forget to continually wish new things for when those saved up wishes run out. What an all encompassing view of what it means to fully love someone. It takes into account the past, the present, and the future. 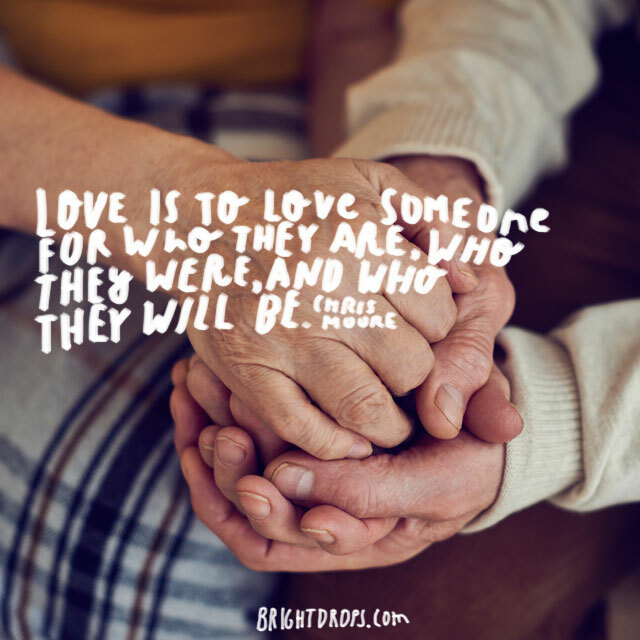 It taps into the timelessness of love and forces us to realize that it’s not just the person that exists today that we’re meant to love, but all of them and all they’ve lived. All too often we want someone to stay the same and be the same person they’ve been, but there’s no guarantee that will happen. It’s a matter of loving the person they become as well. The unpredictability of love is one of its most attractive features if you look at it the right way. Love is definitely not something that you can predict, or rely on, which some might look at as a negative trait, but it’s what makes it so exciting, and what makes it such an adventure. It would be pretty boring if it was predictable and something you could manipulate and take for granted. But love is constantly changing and rearranging, it’s an organic substance that is always in motion. 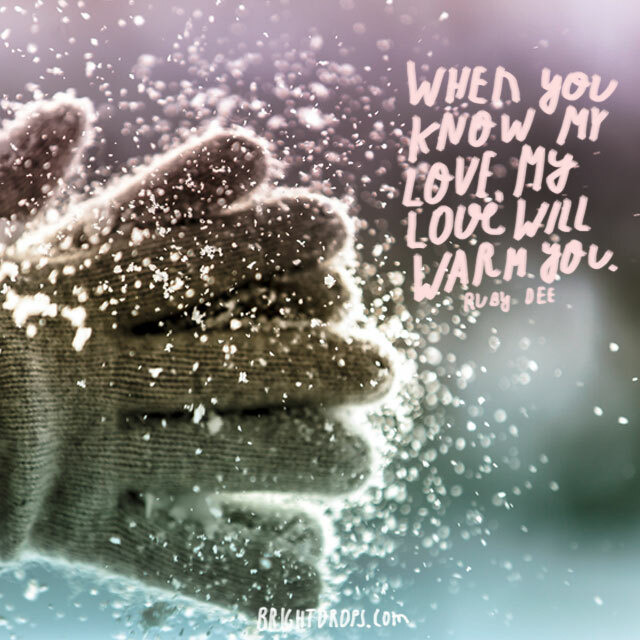 Learning to embrace this unpredictable nature is part of learning to love better and stronger. 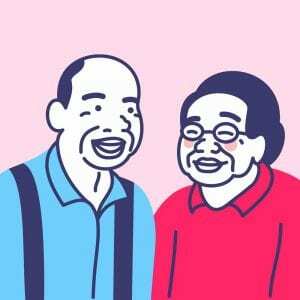 The warming sensation often associated with love is one way to describe the feelings that come along with it. If the absence of love conjures up feelings of icy coldness and bitterness, then the opposite must bring upon feelings of warmth and goodness. The best way to know someone else’s love is to first love them with all of your might. The warming sensation you provide for them will come back to you twofold and you both can bask in the warmth of the other’s love. 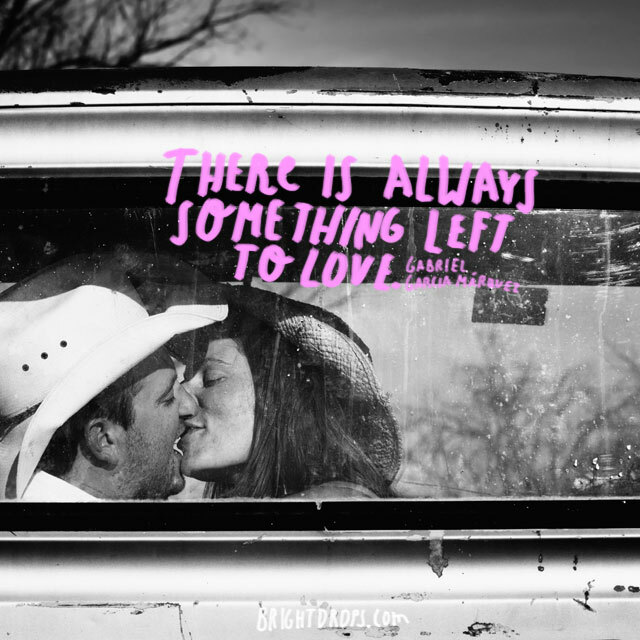 Love with a sense of desperation so that you never feel like you’re taking the other person for granted. It’s easy to get lulled into a sense that they’ll always be there, but life is not guaranteed, and loving someone and showing that love on a daily basis is important if you want to have no regrets later. You’ll look back at the times when you only loved with half a heart as times that you wish you could live over again. By loving someone so intensely, the way you would if you knew you wouldn’t see them again, you are leaving nothing on the table. It’s true that there is only one force that can turn an enemy to a friend. Nothing else can do it, and if you’ve noticed that you have an enemy or two in your life it’s most definitely because there’s a lack of love towards them. You can be the bigger of the two and choose to love them in spite of everything that’s taken place. The trick is that you don’t have to worry if they become your friend or not, just sending them feelings of love is enough because all that matter is your emotional set point, which is raised up by getting rid of the hatred and turning it to love. Walking around with a silly grin on your face because you’re in love is one of the greatest things to do, even though it may be a little embarrassing. It’s okay because you won’t even care who sees you or if they think you’re crazy, you will be off in your own little world and thinking about all of the things that you love about your sweetie. Perhaps that’s why there are so many quotes about love that talk about how it’s irrational or illogical and you must be insane to be in love. It overrides our reasoning mind and makes us feel good even without a reason. 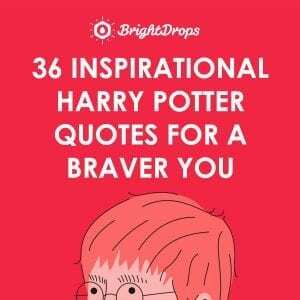 The image that this conjures up is what makes this love quote so fun. Love really is a magical force, and there’s nothing else like it in the whole universe. If there’s life on other planets they will surely have a notion what it means to love because it permeates all of creation. 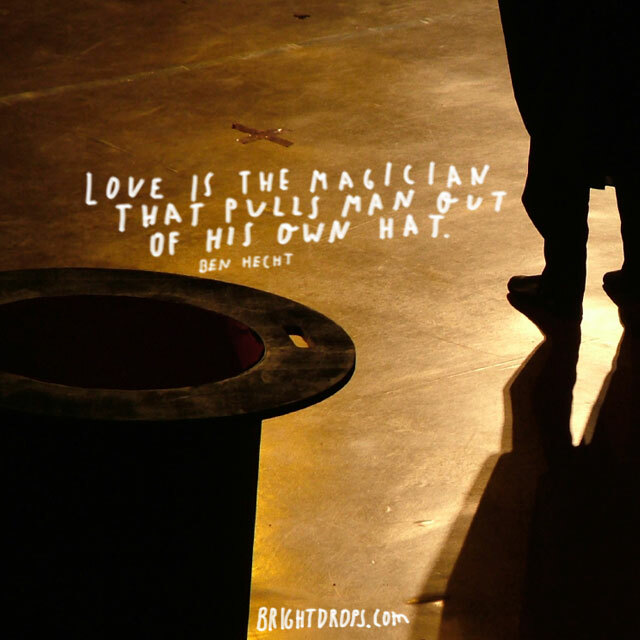 This quote shows the power of love can perform great acts that seem like magic, it can transform both men and women into better versions of themselves, and has been known to do so for ages. 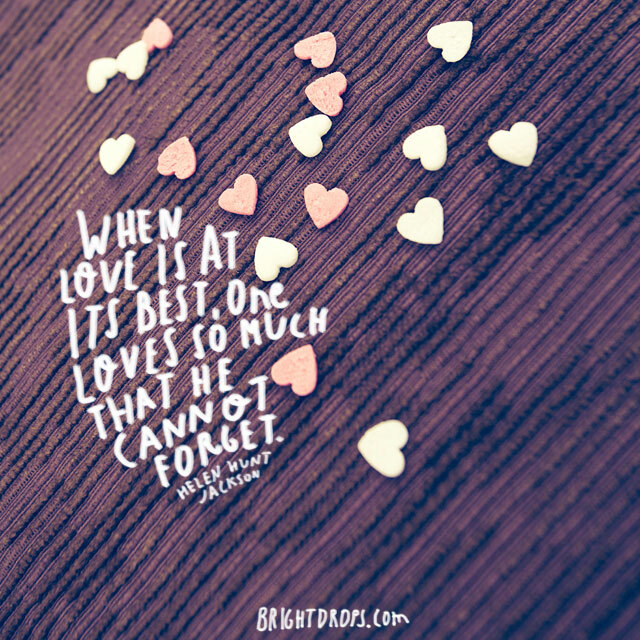 If you’re worried about forgetting a love you’ve once had, don’t worry, because this quote says that if you do forget it wasn’t love at its best. If the love is of a high enough quality you won’t forget it, so it’s nothing to worry about. Your only concern should be whether you’re loving enough in any given moment. If you feel that you don’t have enough in your life to love, then go more broad. There’s always something to love, even if you just focus on loving life itself. Here’s a statement that shows that if you’re smart you’ll love. 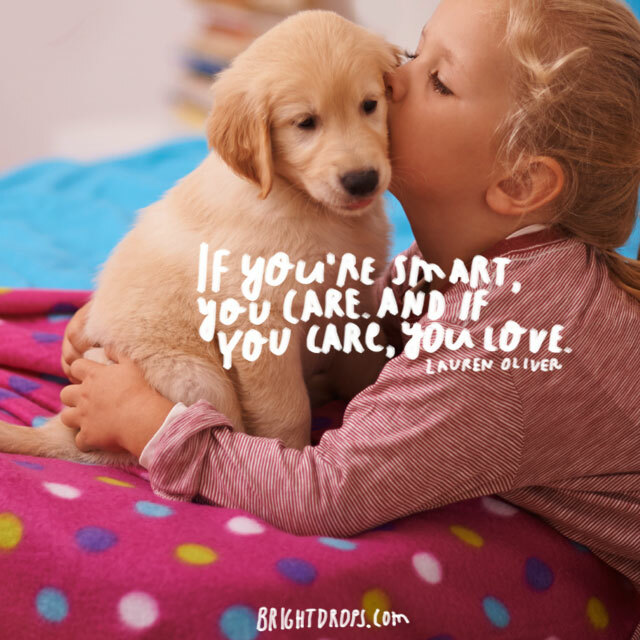 Caring and love are closely related, and if you’re smart and get all of the facts you’ll find it in you to care. If you care, you love automatically because they’re that intermingled. It’s impossible to care and not love or to love and not care. A smart person does both, even though foolishness is often linked to falling in love. If you really think about a situation or a person, you will eventually care, and then love follows automatically. 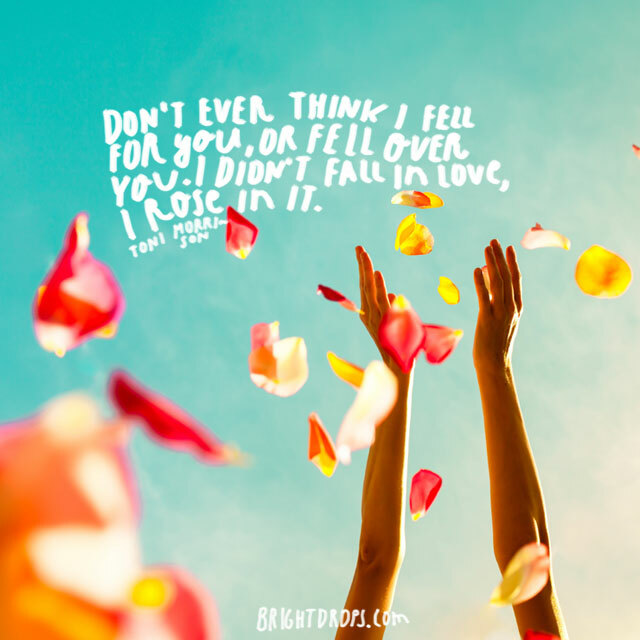 The term “fall in love” is often used, but she is pointing out that there isn’t anything negative about the act, and she’s turning it on its head to say that she became more than she was by the act of loving. It’s funny to think of why the term falling in love came into use, and why it’s still used today. It’s more of a lifting feeling than a dropping feeling, but it’s just a phrase that gets tossed around a lot and everyone seems to know that there isn’t any negative connotation to it. The next time you get into an argument with someone you love, remember that it’s not important who wins the battle of the head games. 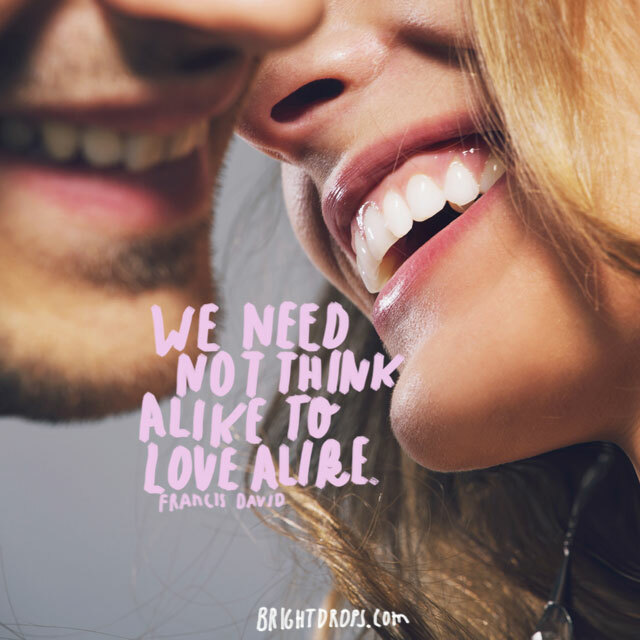 Love is not affected by what we think, it is something we feel, and here’s a reminder that you don’t have to think alike in order to love each other. It’s more interesting to have someone you love that has a different way of thinking on an issue or a topic than you do. It will open your own mind and you’ll open theirs a bit, and you can still love each other with that love going untouched even during a heated exchange of words. 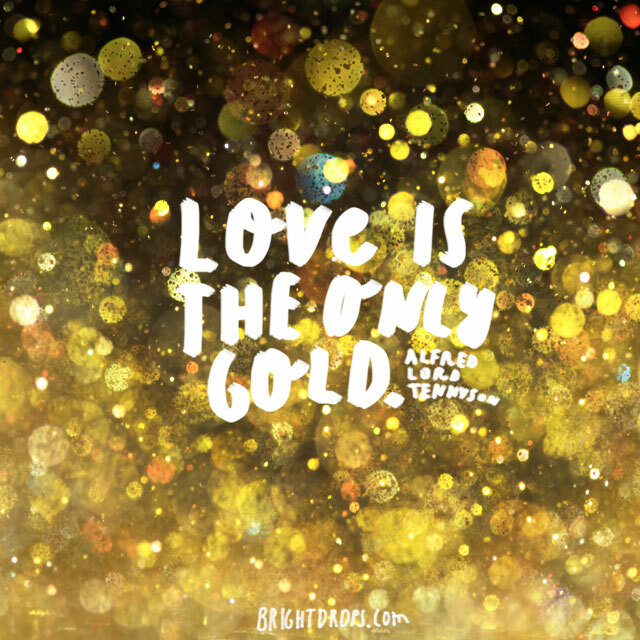 With all of the different currencies and all of the precious metals in the world, it’s interesting to think that the only thing that is of any real value is love. This is why so many rich people seem miserable, and why there is a song that says money can’t buy love. The person who is rich in love is the richest of the rich, no matter what their pocketbook might say. That’s why you can get rich quick because love is something you can conjure up on your own, and give freely to those that are deserving. You have to put your spirit into love because the two are similar to each other in nature. Your physical self might have trouble connecting with the feeling of love because it’s a palpable energy, but an energy nonetheless. Once you align your spirit to the frequency of love you’ll find that you can tap into whenever you’d like. 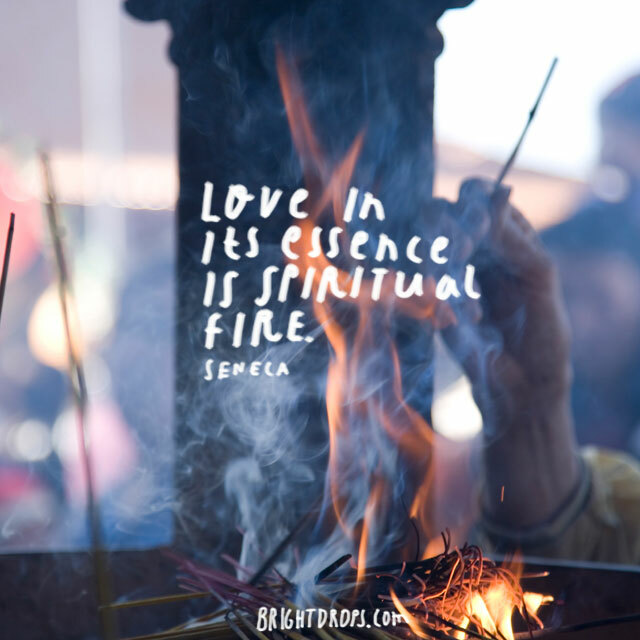 The spirit is endless and so is love, which is why the two resonate so well together. If you’ve been feeling like you’re falling flat with love, try injecting more of your true spirit into it. 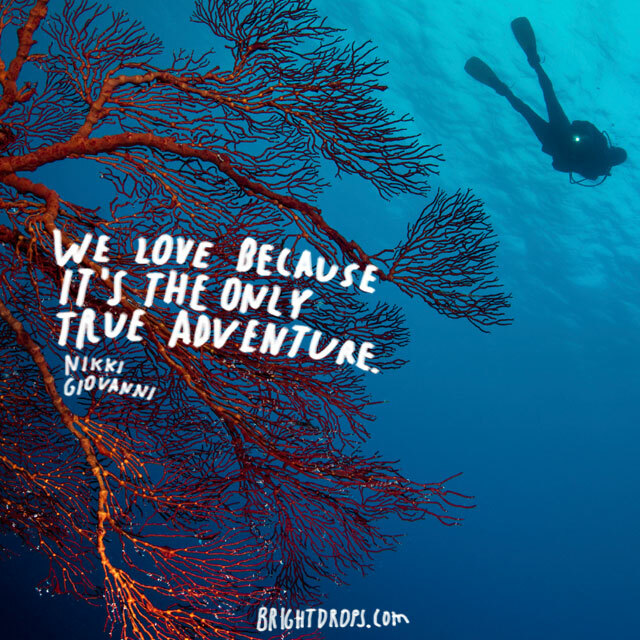 What a grand adventure love is. It has all the markings of an adventure thanks to the twists and turns and the highs and lows that come with it. There’s so much energy involved, as well as excitement and nervousness that it really goes unrivaled. You might seek out travel and adventure sports and activities, but nothing is the same as what love will do to you. As long as you’re ready for the adventure it will be the time of your life. If you’re not ready you may not want to venture down that road until you are. When you start with friendship as your base and heat things up with passion you’re on your way to an amazing love story. If you’re not friends with the one you love then you may find that love burns out and there isn’t anything left to the relationship. When you are friends that also love each other with a passion, you’ll making it through those waning times and be able to go the distance. 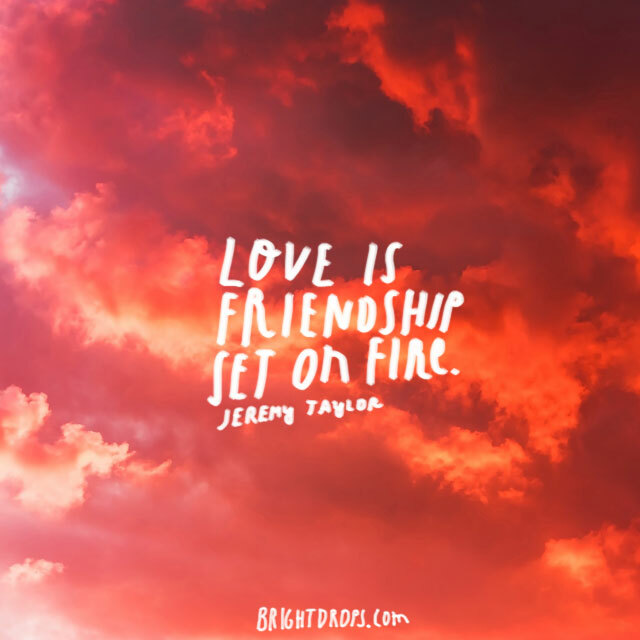 This isn’t to say that you’re burning up or destroying your friendship, but that you are heating things up and making it blaze bright. Sometimes love just isn’t a big enough word for the way you feel about someone. It doesn’t seem to sum up all of the emotions that are going on, or the feelings that you’re having. Here he’s saying that the love they shared transcended what we think of when we think of love, and that it was something bigger, more expansive, and pretty much something that couldn’t be described with the language that we have. Love is there at all times to guide us. It is not something that goes away for a time but then comes back, it’s always there just like the stars in the sky. You might not always be able to see them, but they’re still there. You can rely on them, and find comfort knowing that they’re there even if you aren’t reminded of it all the time. Learn to trust in love, even when you don’t necessarily feel it. It’s always there and can always guide you home. Have you ever noticed that food tastes better, the air smells sweeter, and everything just seems to work out better when you’re in love? That’s because at those times you are at the very peak of what it feels like to be alive. If you’ve fallen into a rut of not living life fully alive it could be that you need an injection of love in your life. You can attract love by trying to live life to the fullest even before love arrives. Love is too scary ??? ?